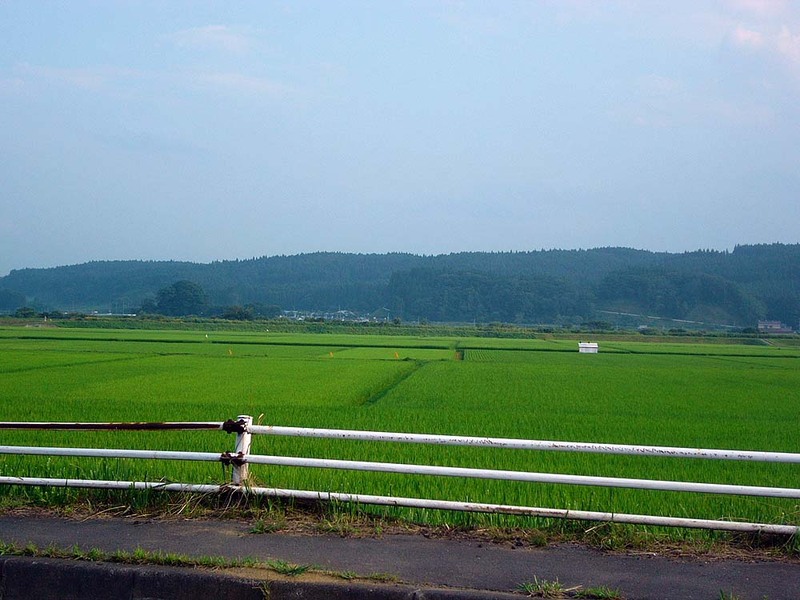 A landscape of northern Iwate seen from the main road on the way to Hachinohe. 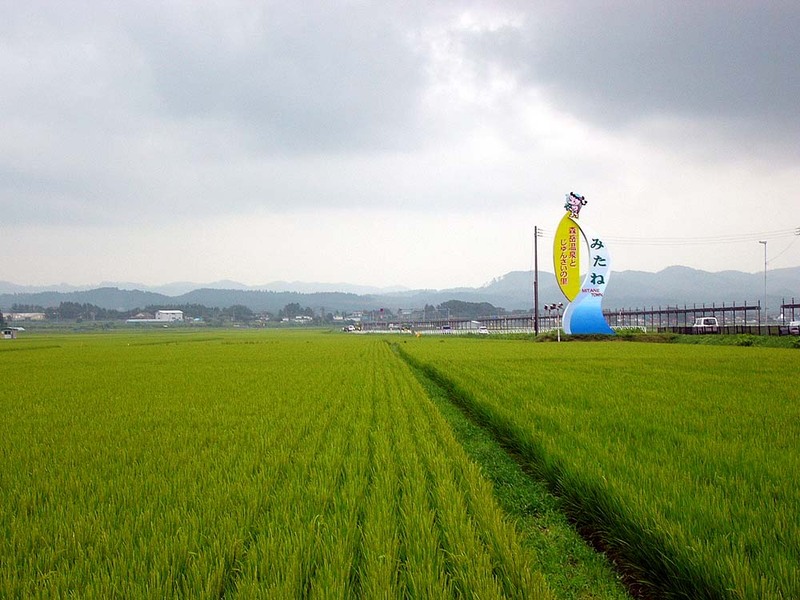 A scenery in northern Iwate on the way to Hachinohe. 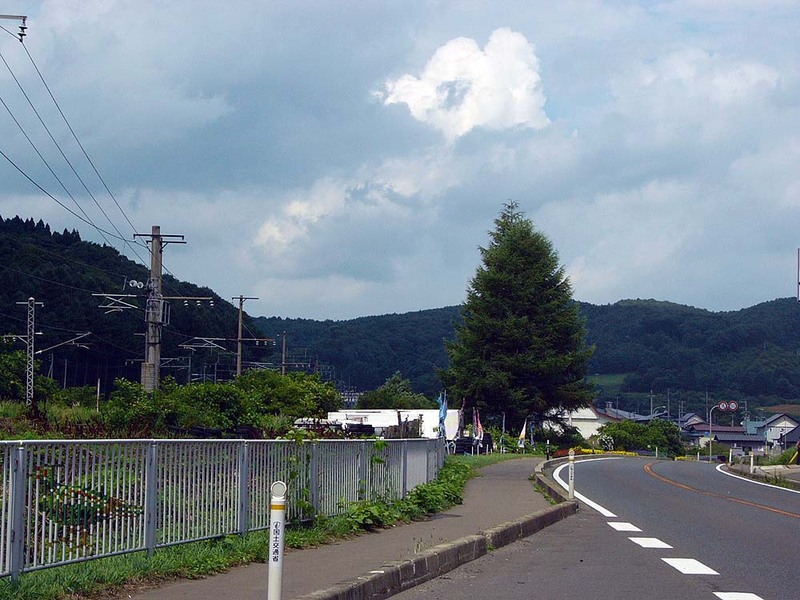 Ninohe city seen from the main road. 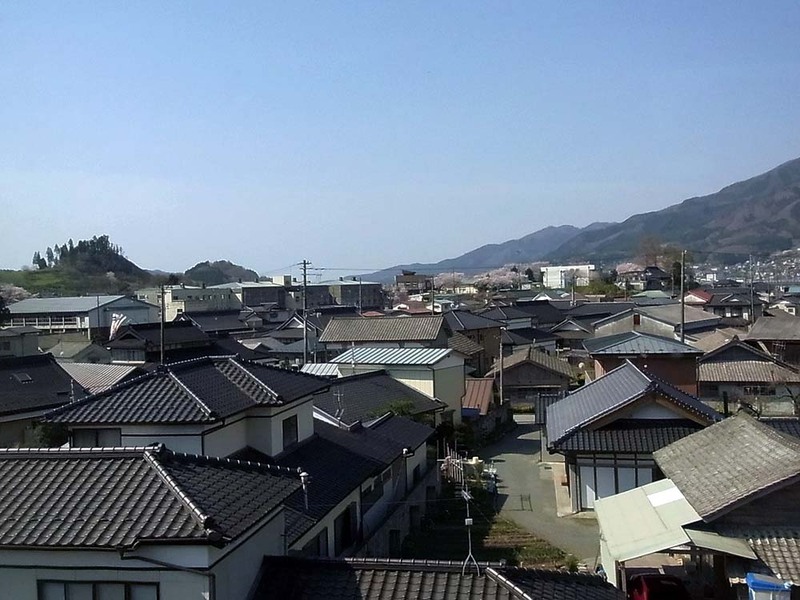 There became a town in the basin surrounded by mountains. 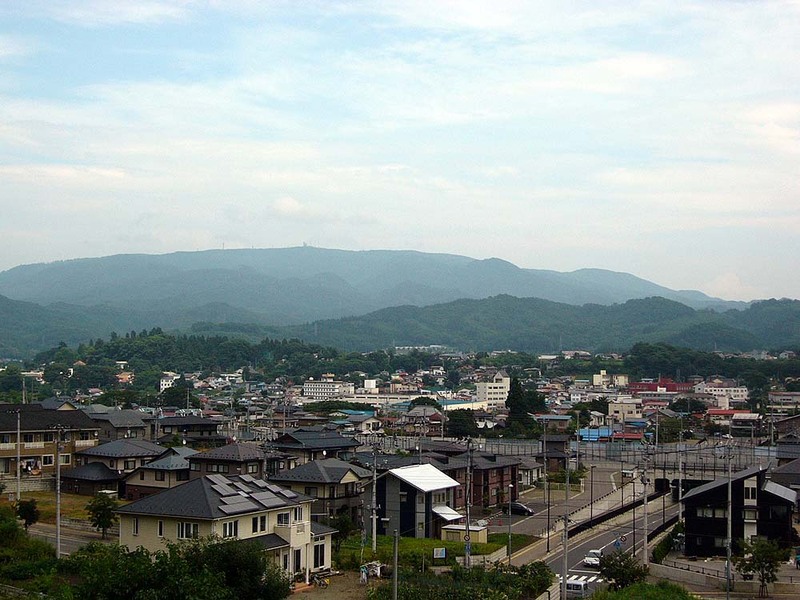 A landscape of Aomori as viewed from the mountain that is at the border between Iwate and Aomori prefectures. 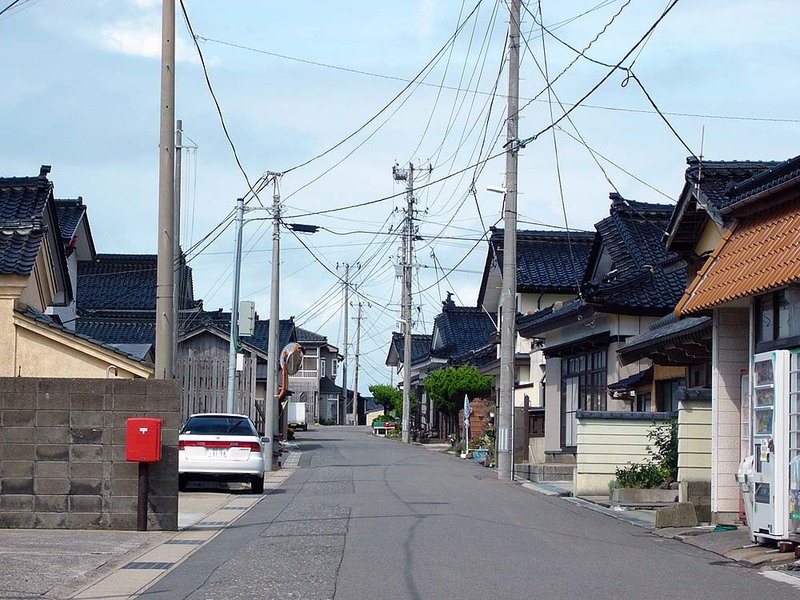 A scenery in Ninohe city. 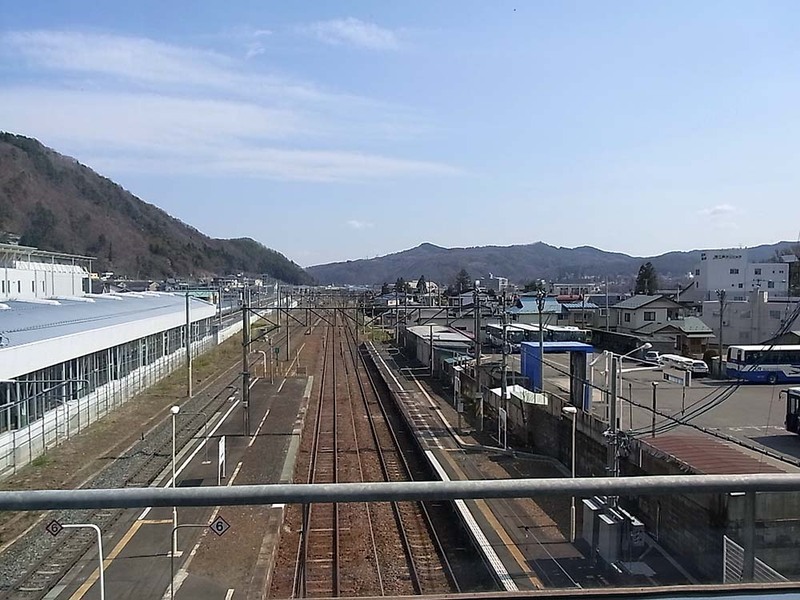 Ninohe Station from the view of the overpass of the station. 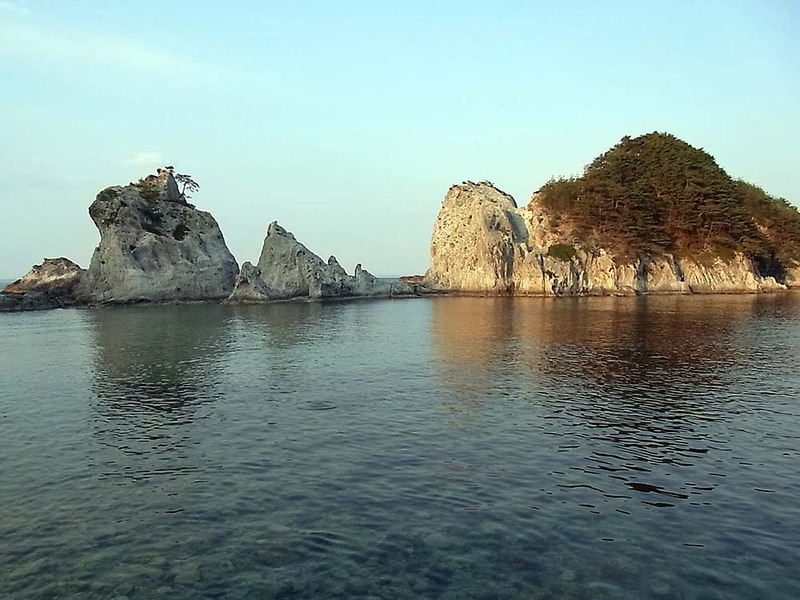 A scenery of northern Iwate coastline. 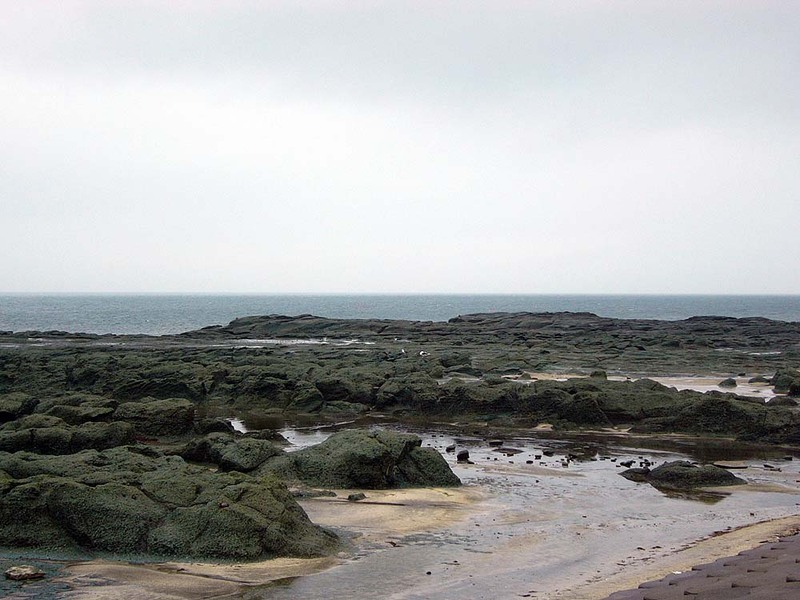 The coastline has unique shape and up and down. 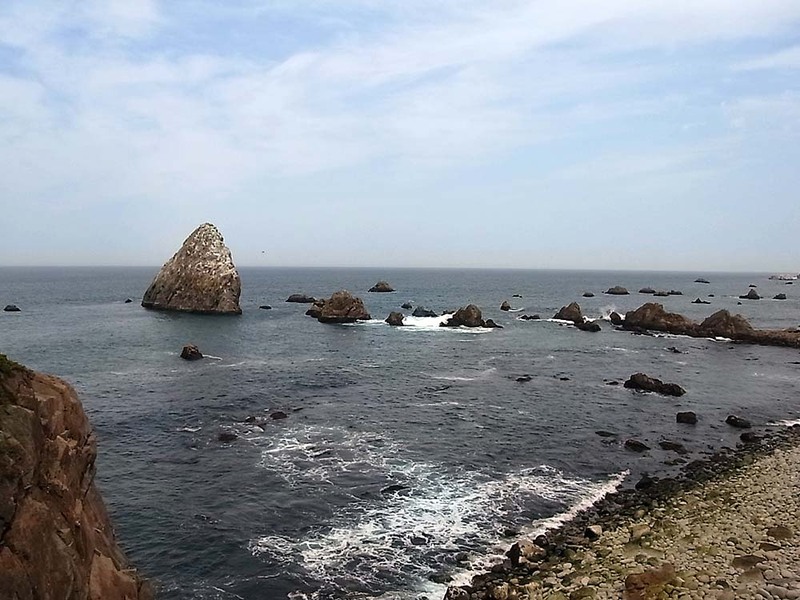 Pacific Ocean seen from the coastline. 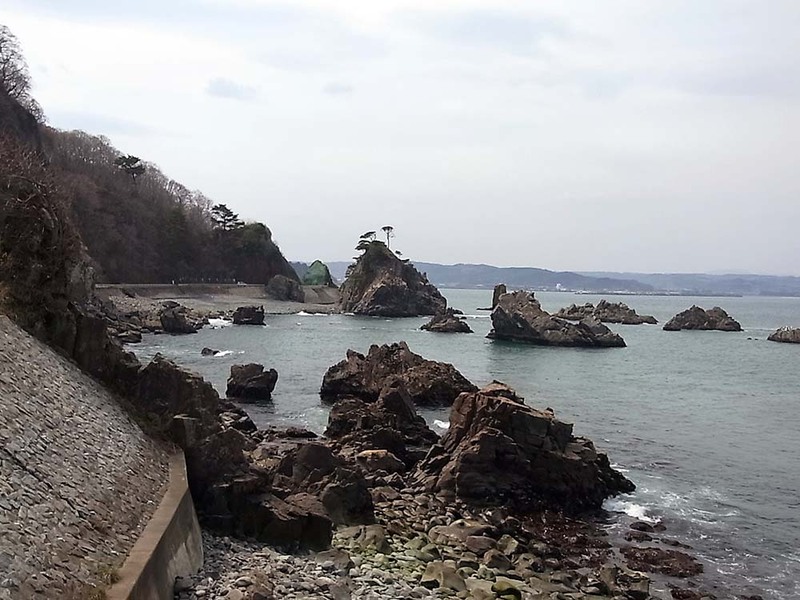 There are many rocks on the shoreline. 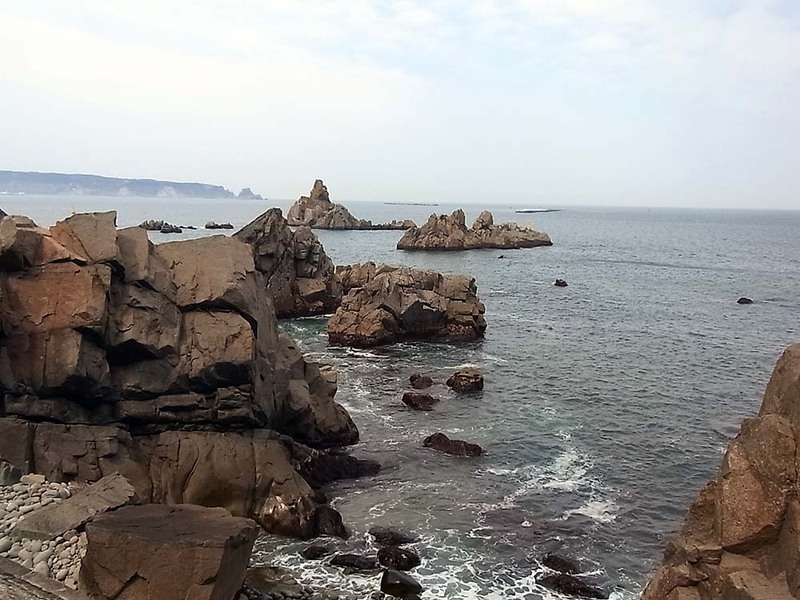 If you look at the sea from a high place, the combination of the big rocks and the horizon on the sea makes a majestic scenery. A deeply indented coastline is followed all the way. 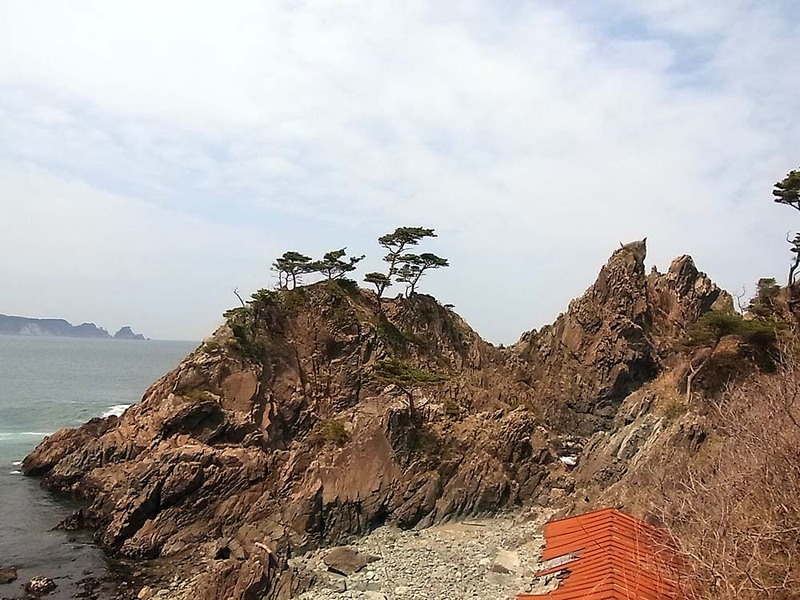 The combination of the rocks, the sea, and the sky makes good scenery. 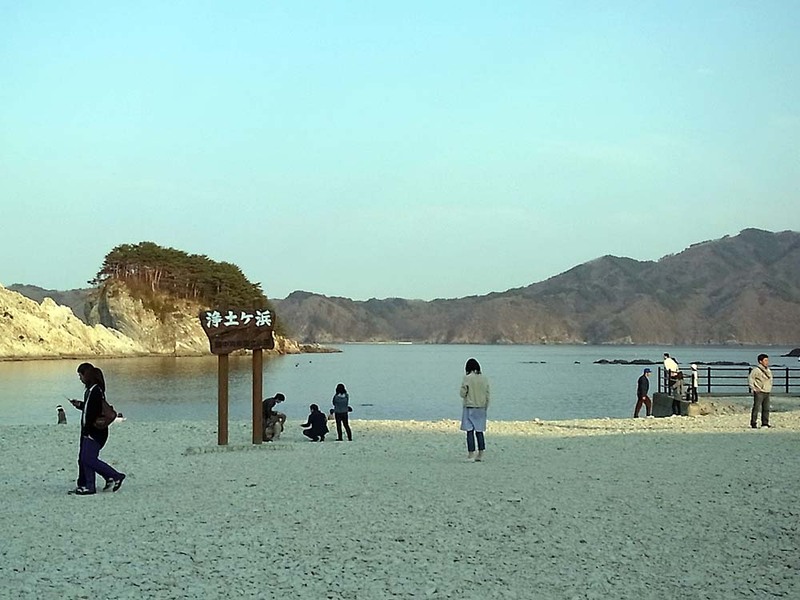 At a beach in northern Iwate. 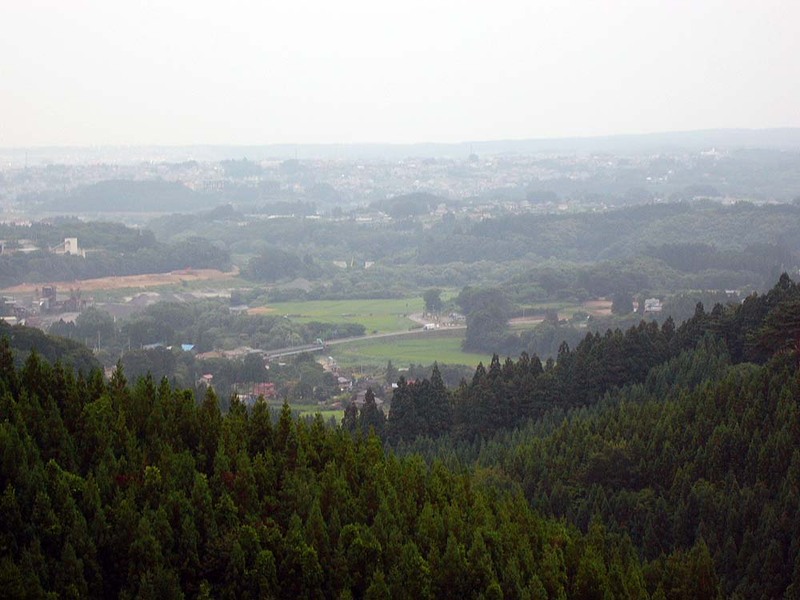 A landscape seen from Kita-yamazaki observatory. 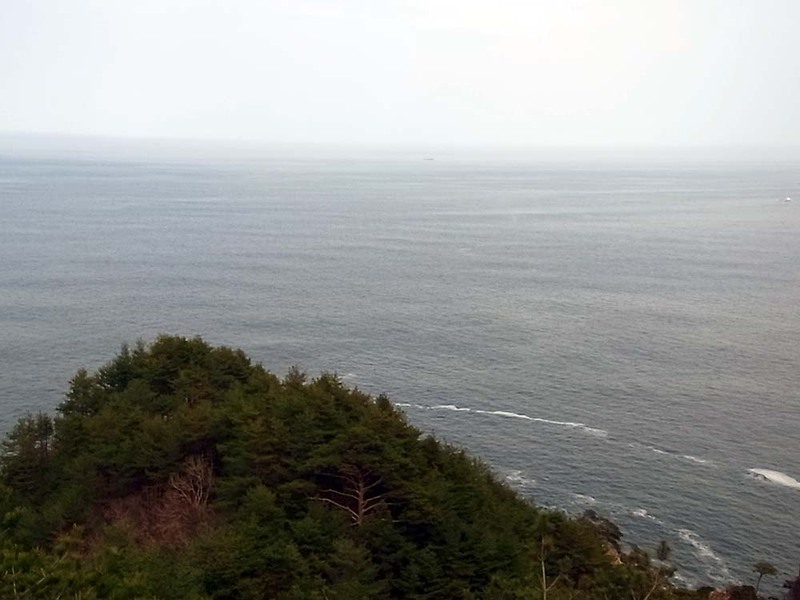 Overlooking at Pacific Ocean from Kita-yamazaki observatory. Pacific Ocean is very large. 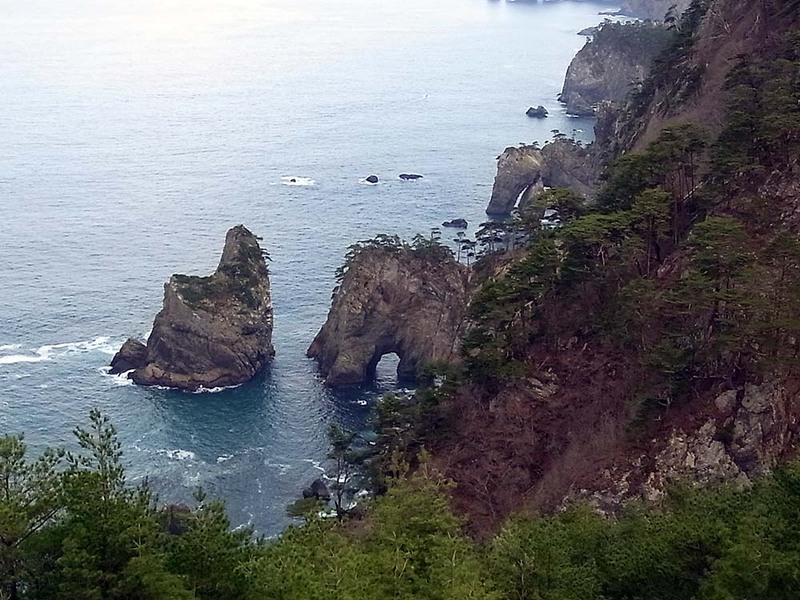 The coastline has a unique shape. 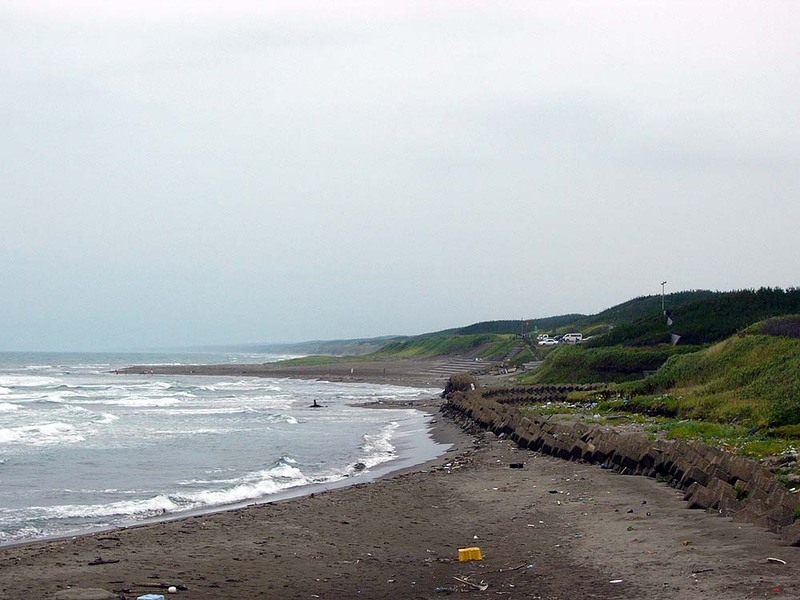 A scenery of the coastline near Jodogahama Beach in Miyako. 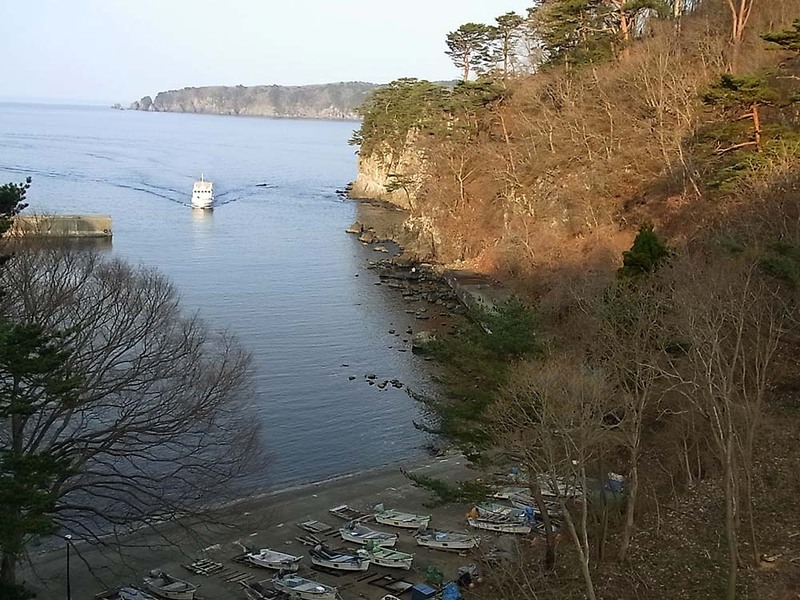 The photo was taken to find a tourist boat. Waterside Jodogahama Beach. 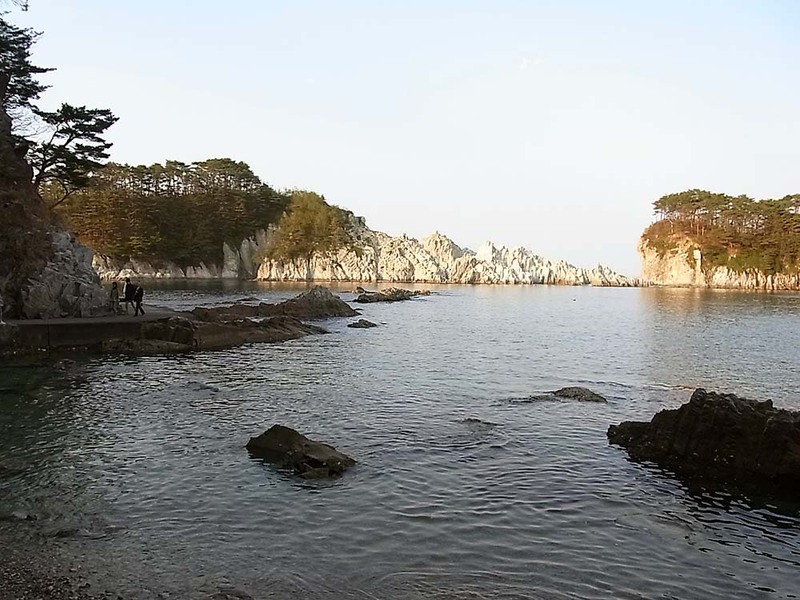 The combination of white rocks, green trees, and water surface with complicated water wave makes the view mysterious. 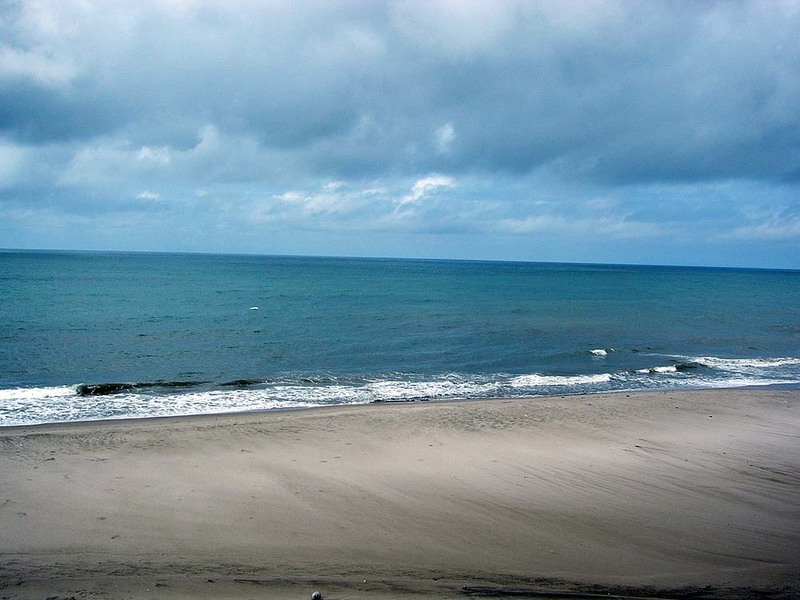 Jodogahama Beach surrounded by land looks like a lake. 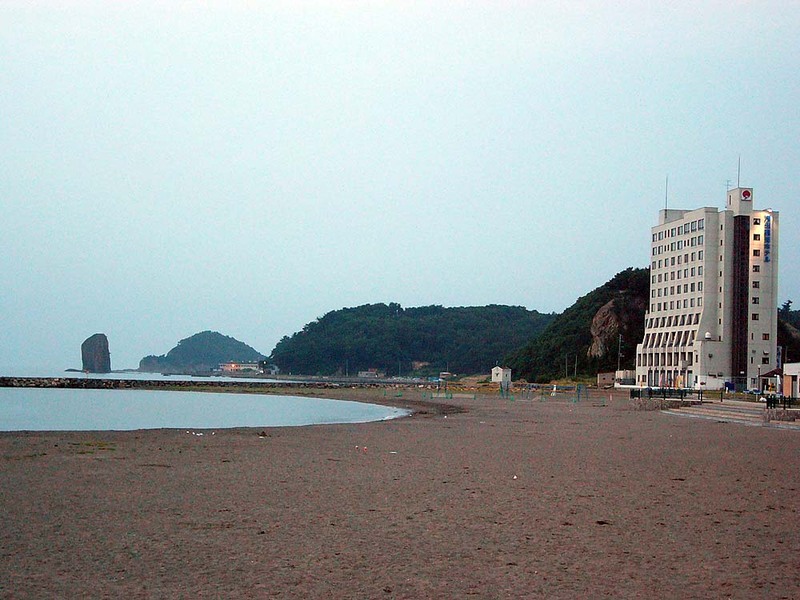 The center of Jodogahama Beach. 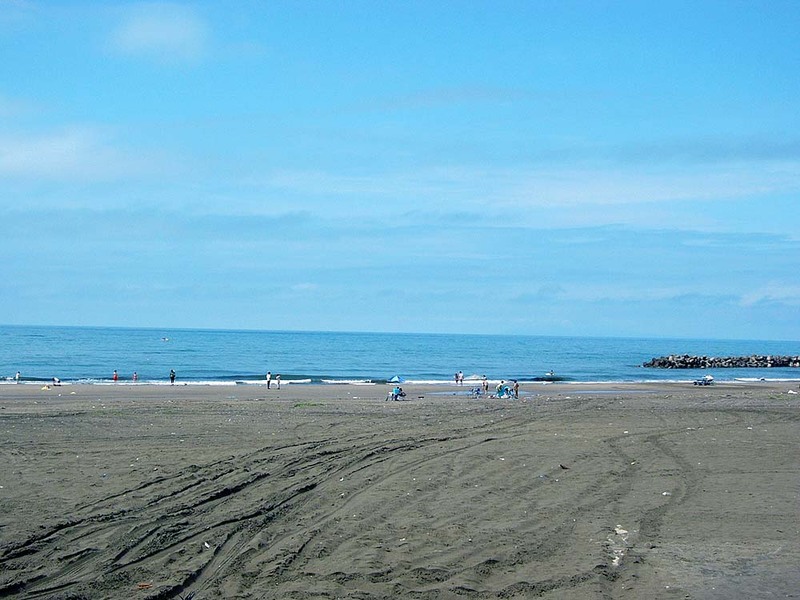 It is sand beach. 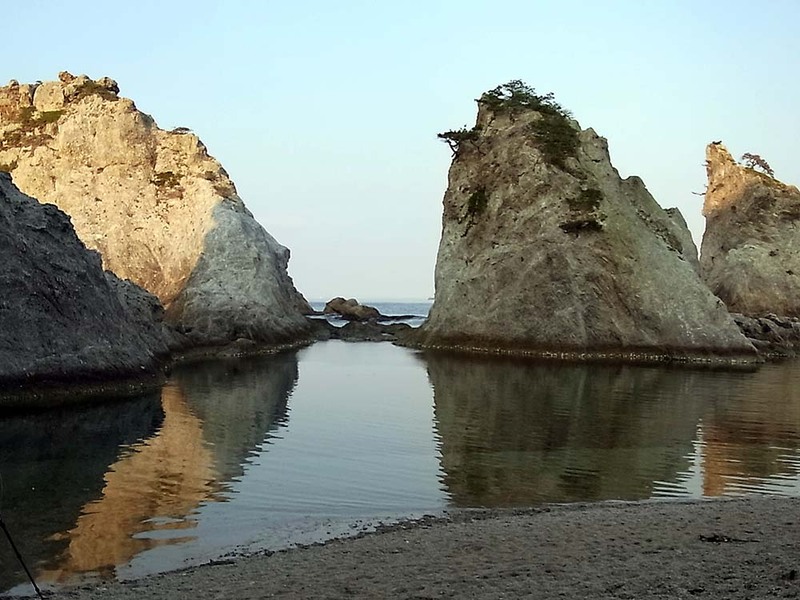 There are many white rocks with interesting form in front of the beach. One of the rocks has a little green at the top. The rocks seen from the side. It is wondering why the rocks are arranged in a row. 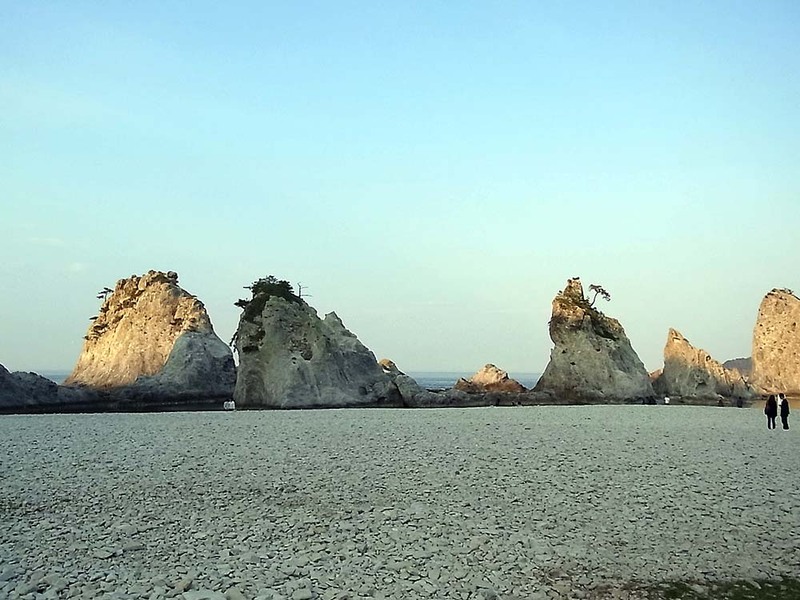 Each color of white rocks is changed depending on the lighting angles of the sun. 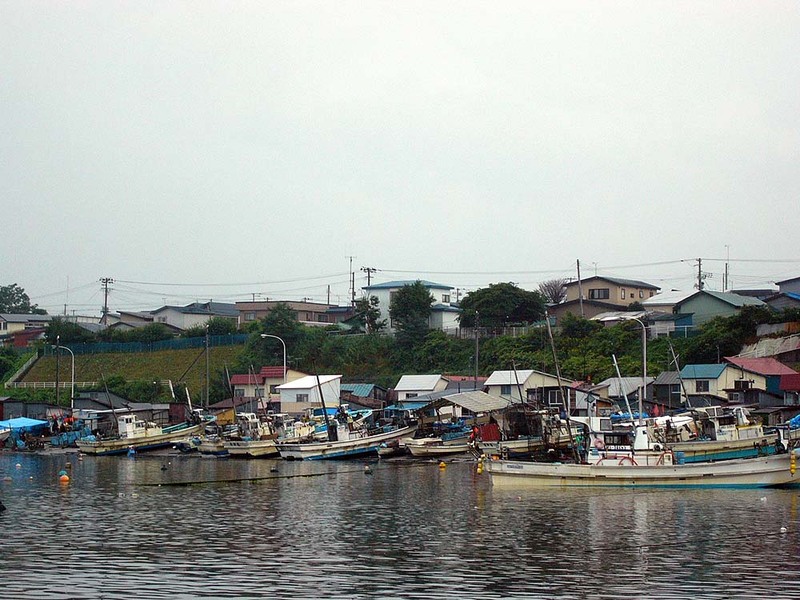 A scenery of Miyako fishing port. 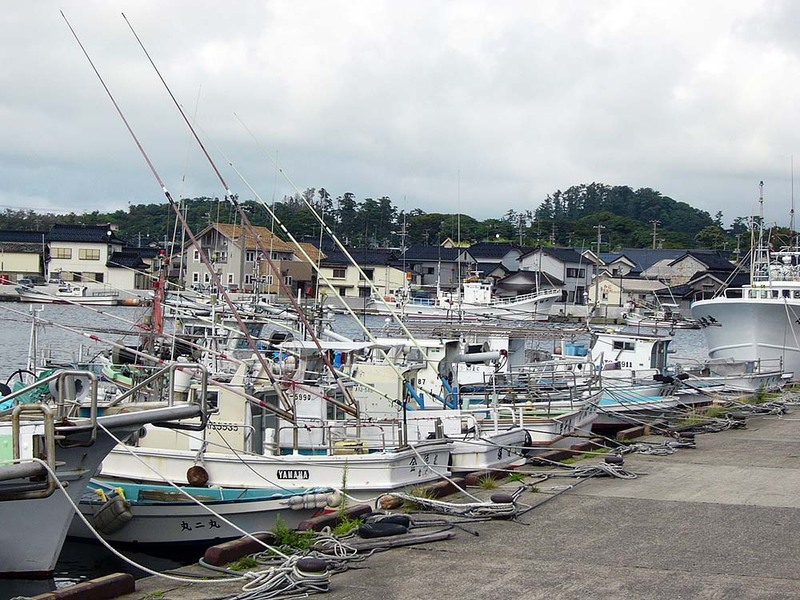 A lot of fishing boats are moored in Miyako fishing port. 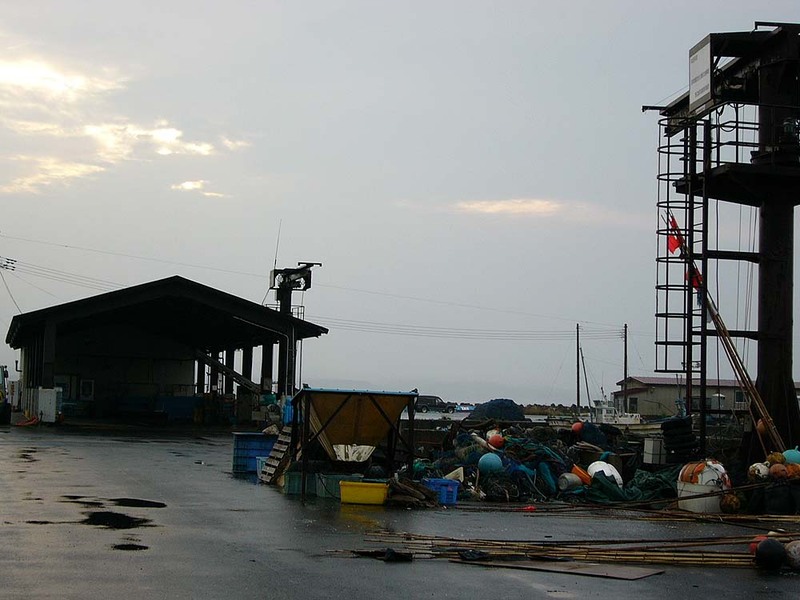 The fishing port at sunset. 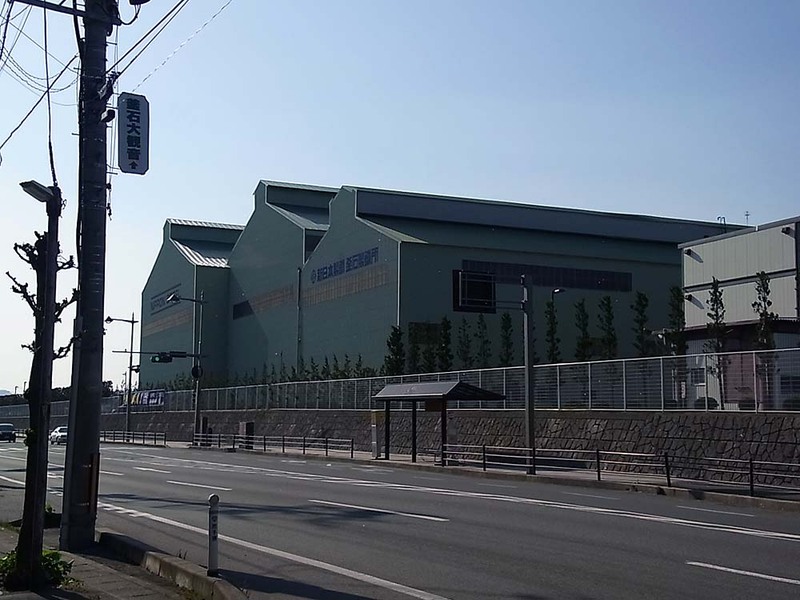 There is a large factory in front of kamaishi Station. 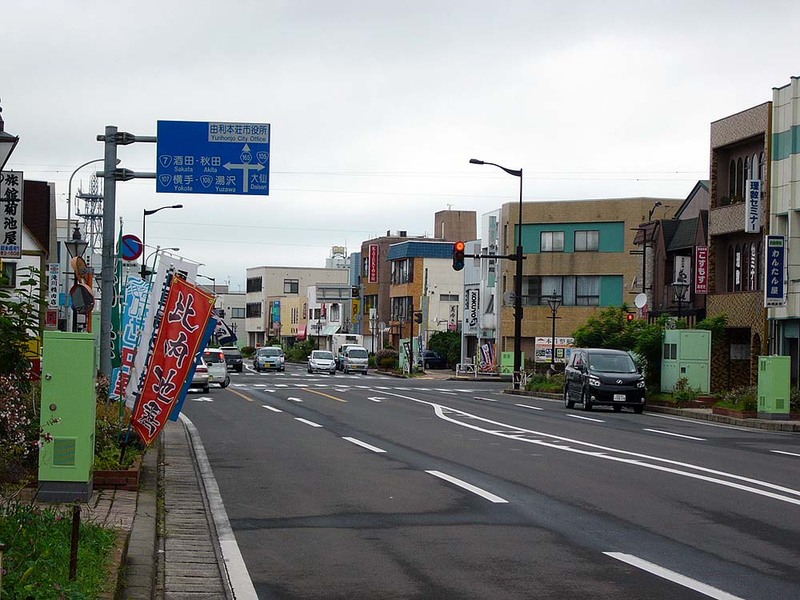 The boulevard before Kamaishi Station. 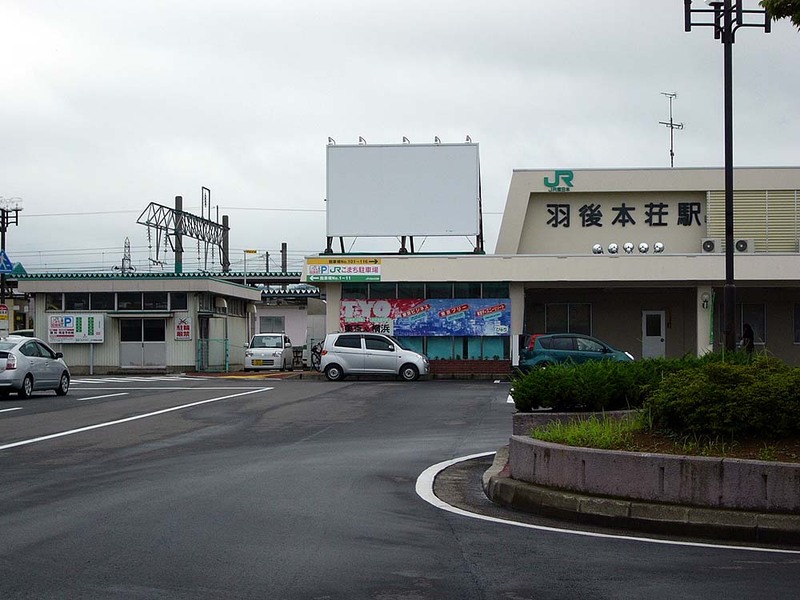 Kamaishi Station. 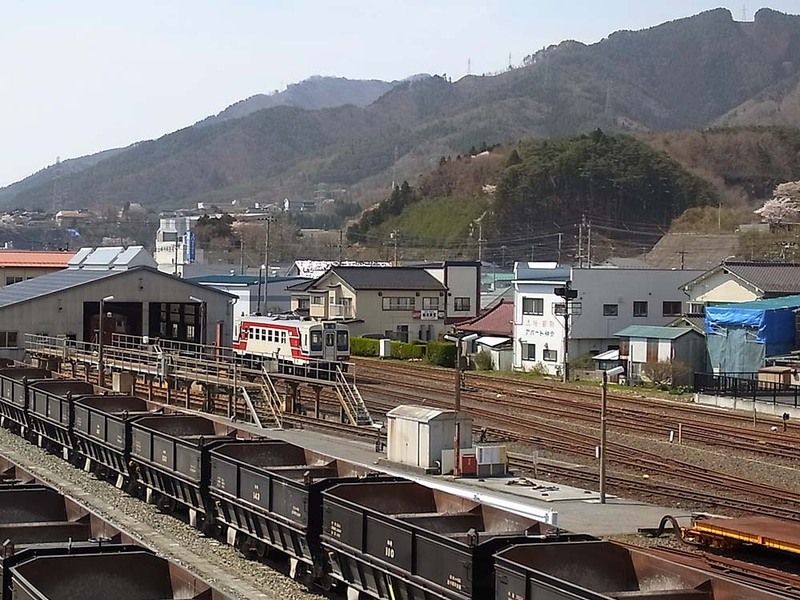 Mountains are near the station. 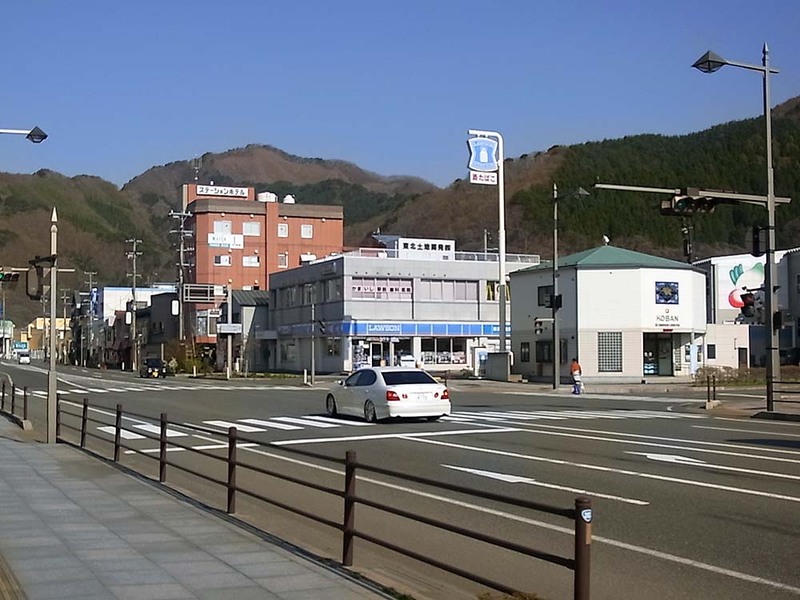 Kamaishi is a town that is surrounded by mountains. 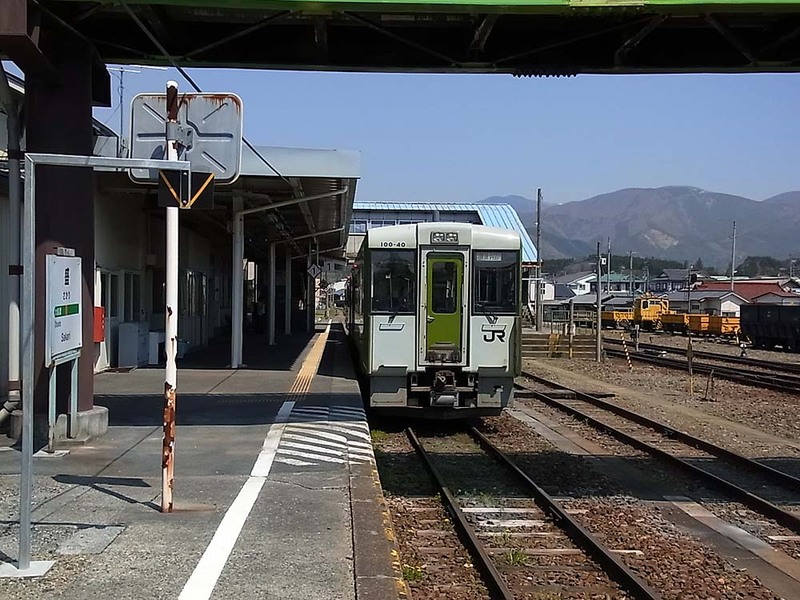 At Kamaishi Station. 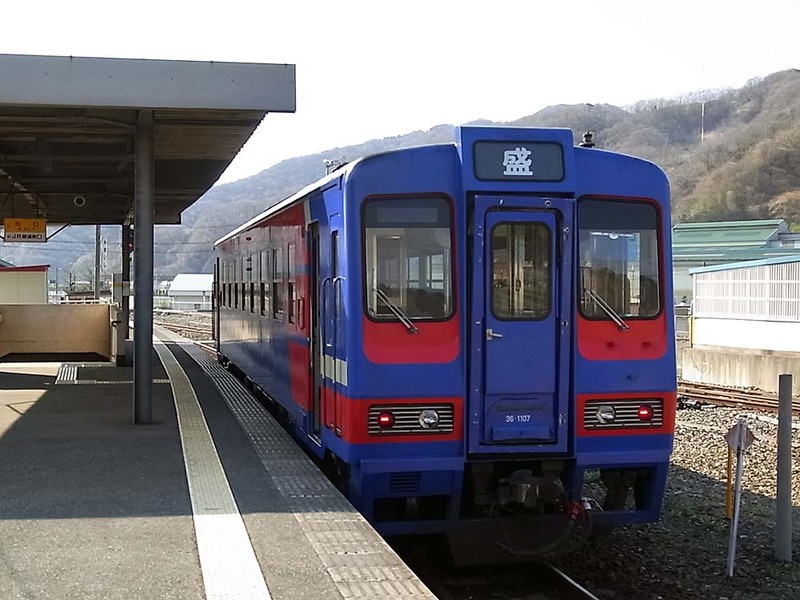 The train for Sakari in Ofunato city was waiting at the platform. 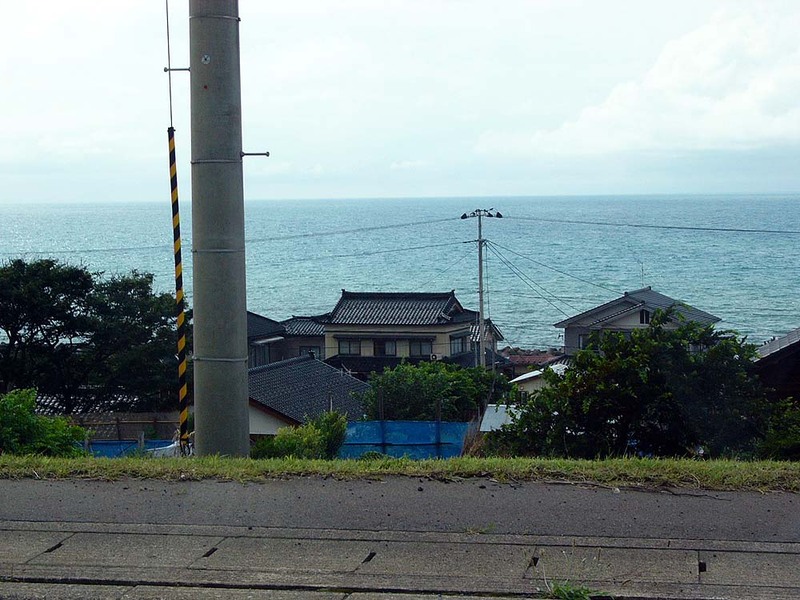 A scenery of the seaside seen from the train of Sanriku Railway. 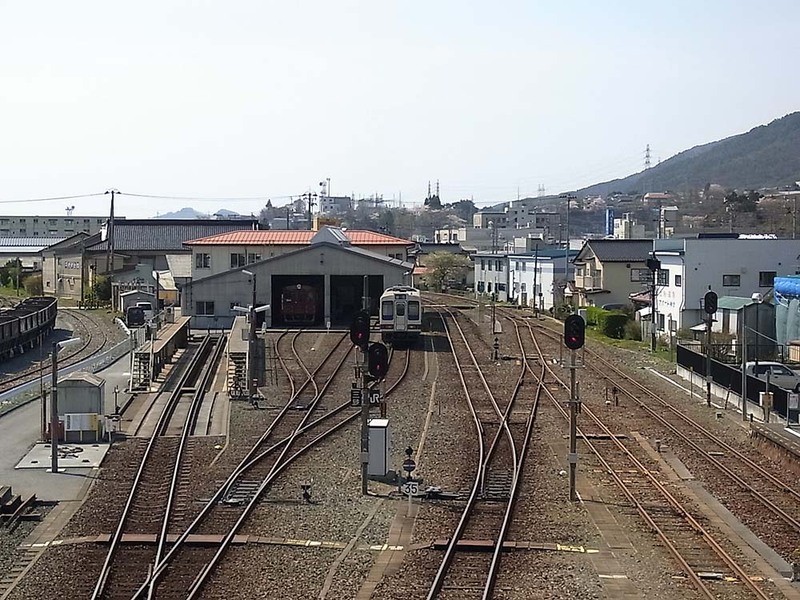 There are many tunnels in Sanriku Railway line. 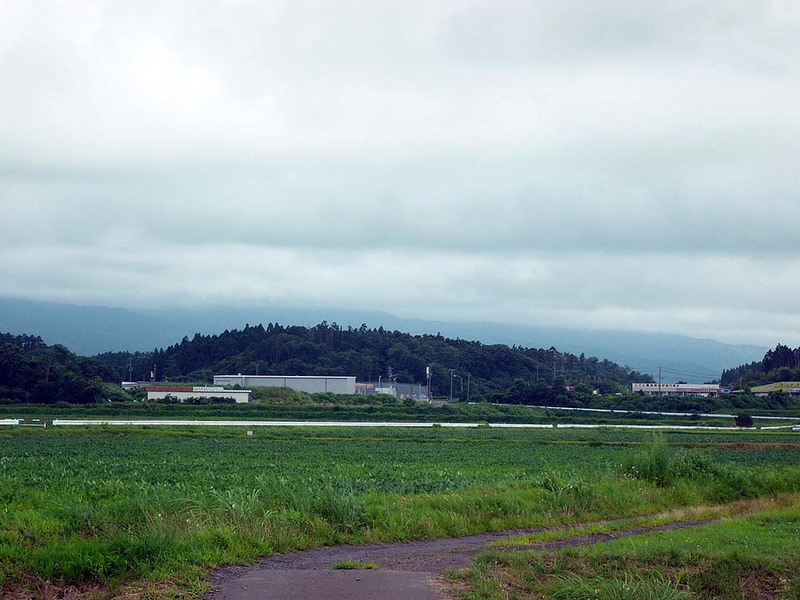 Landscape appears in the short time of interval of the tunnels. 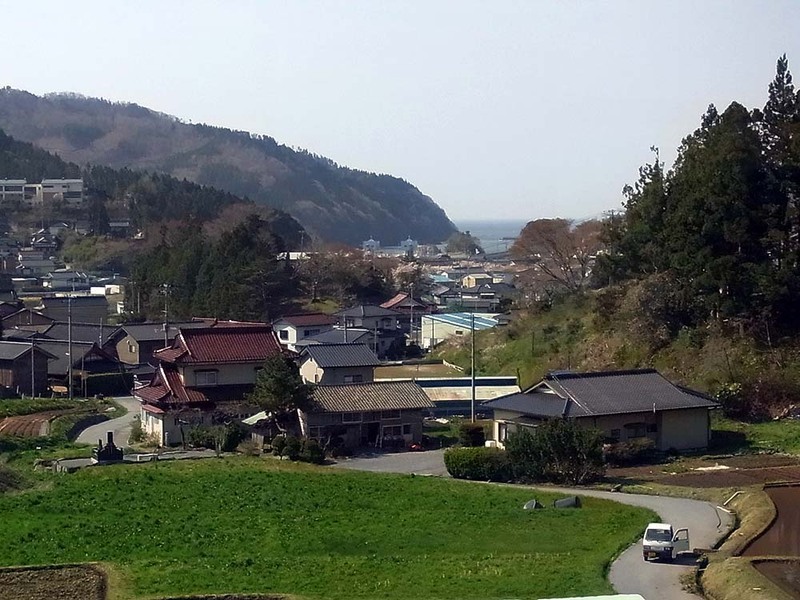 houses are in the small plain around the cove. 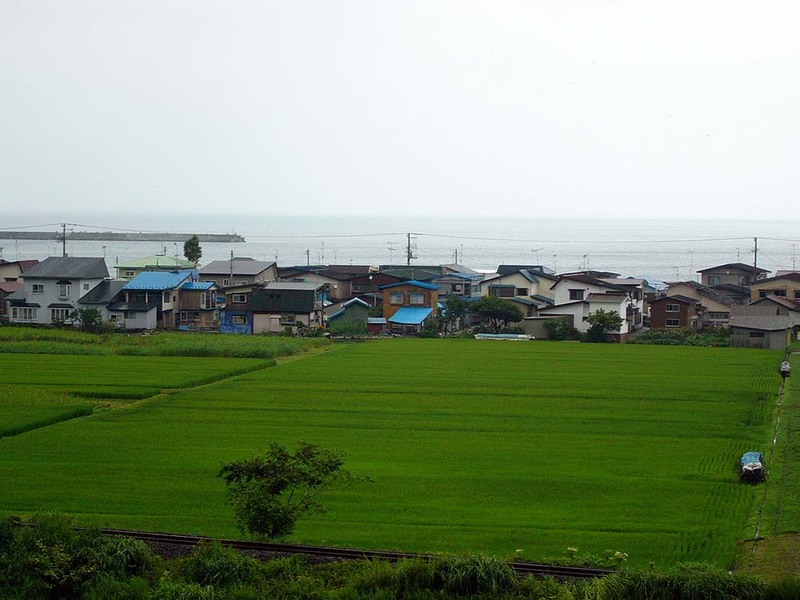 A scenery of the landside seen from the train of Sanriku Railway. 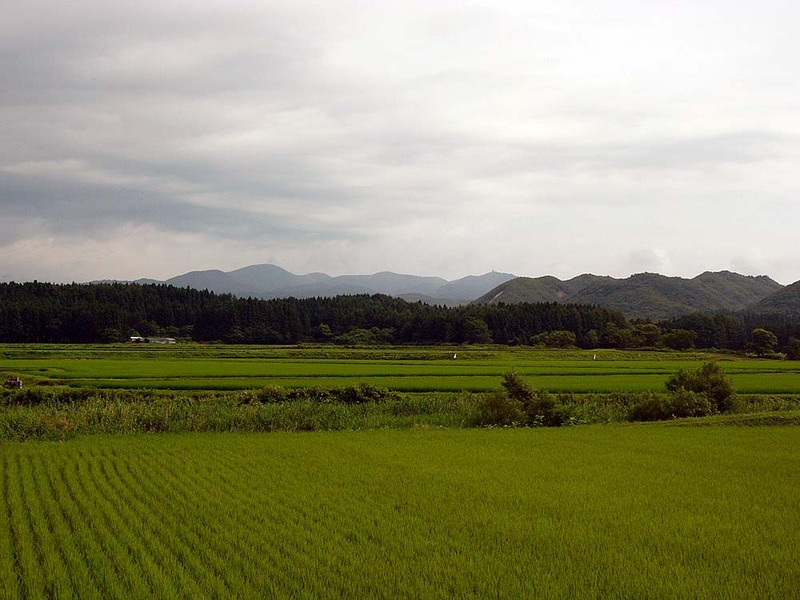 The sea, mountains, and farmland. 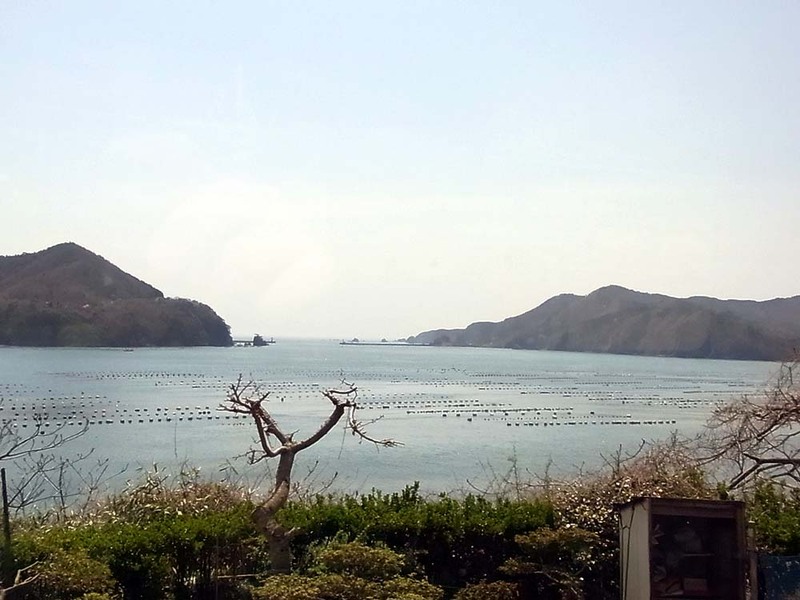 A scenery of the cove seen from the train window. Such a cove is followed by a lot. 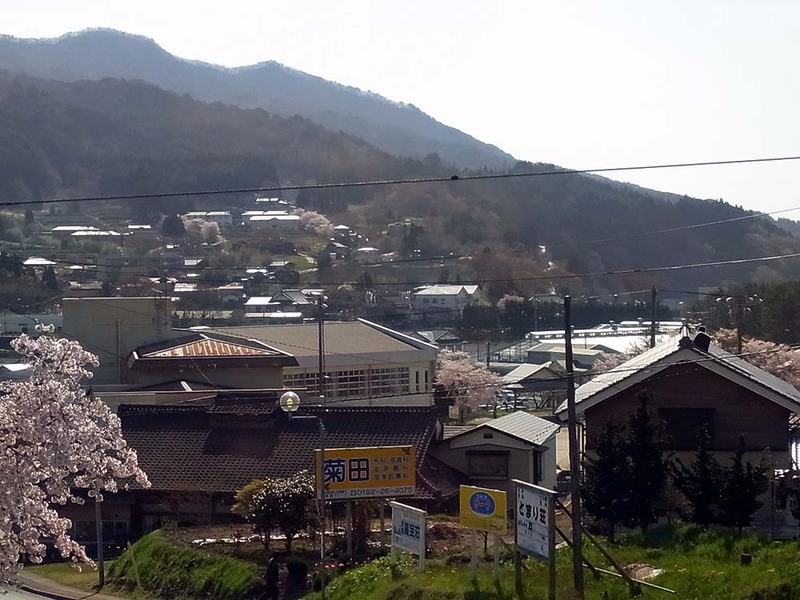 A little away from the coast, mountain countryside appears. 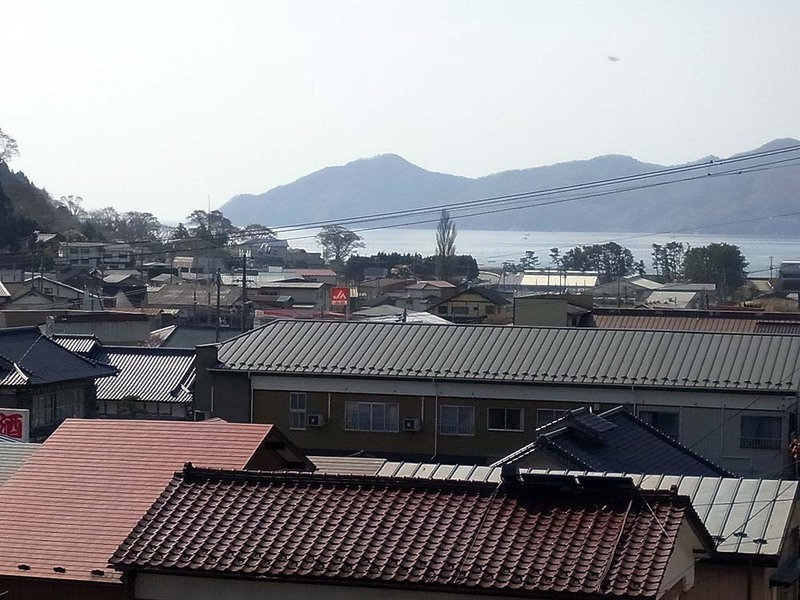 Ofunato city seen from the train window. 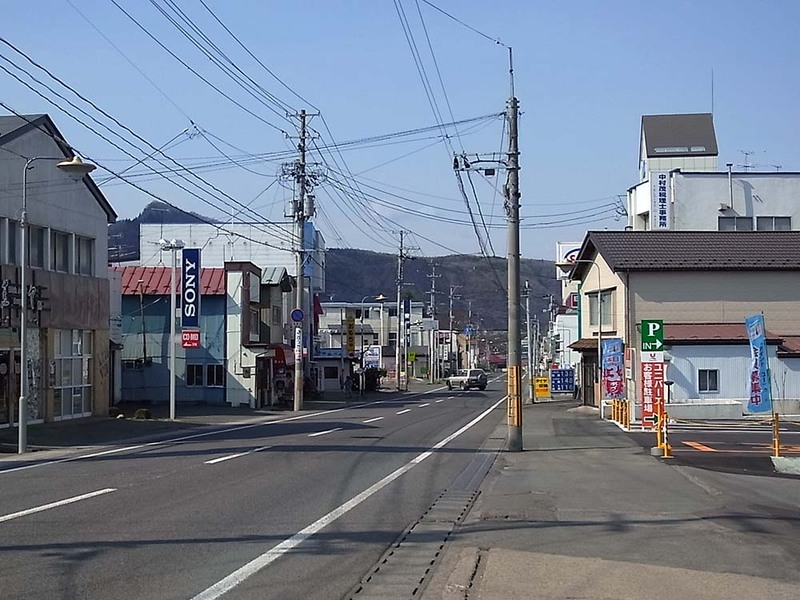 The main street in front of Sakari Station. 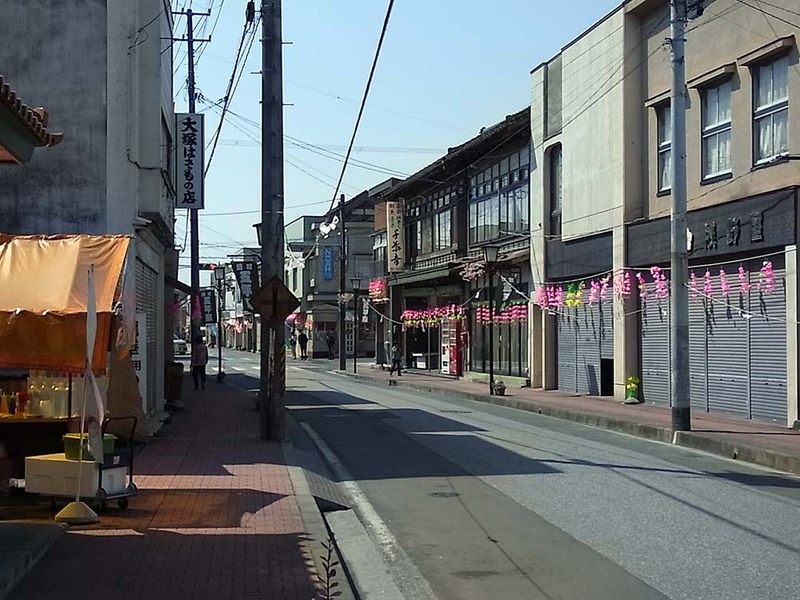 There are traditional wooden stores in the street. 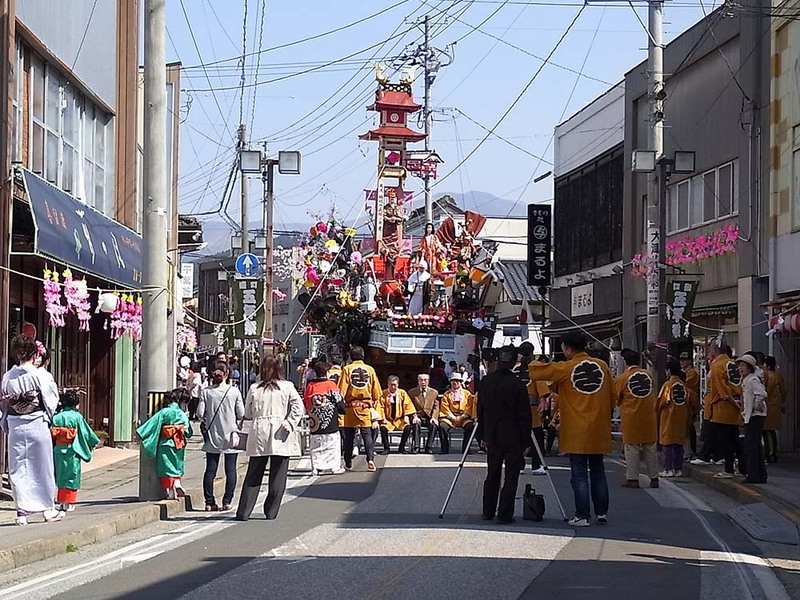 I found people were doing a town festival in the street. 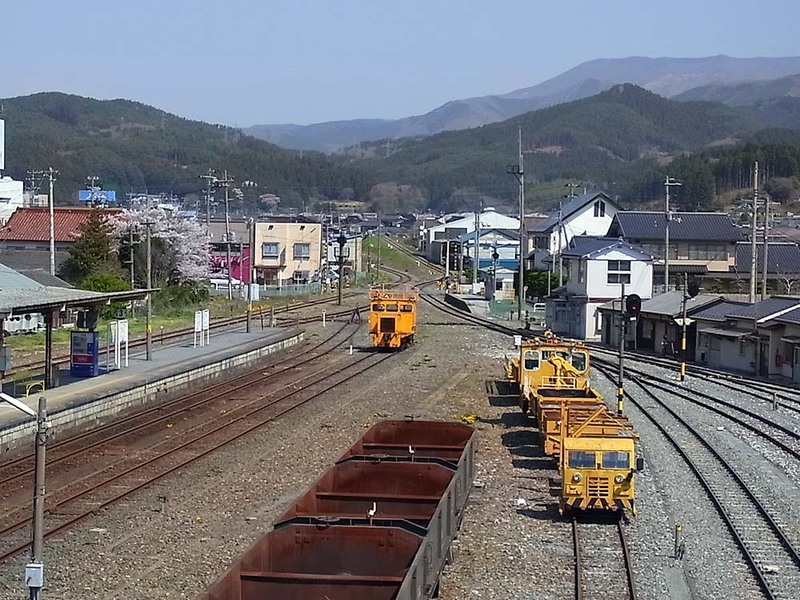 A landscape seen from the overpass of Sakari Station. Another landscape seen from the overpass of Sakari Station. 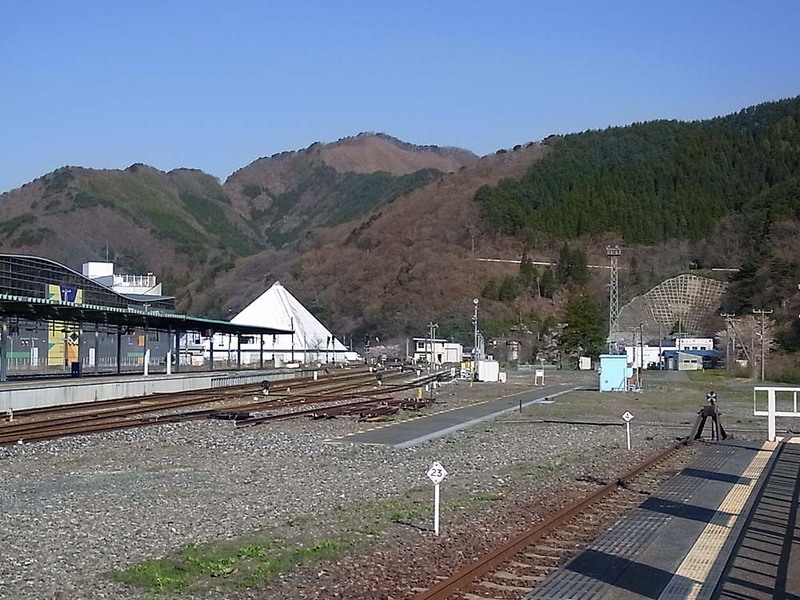 Mountains are near the station. 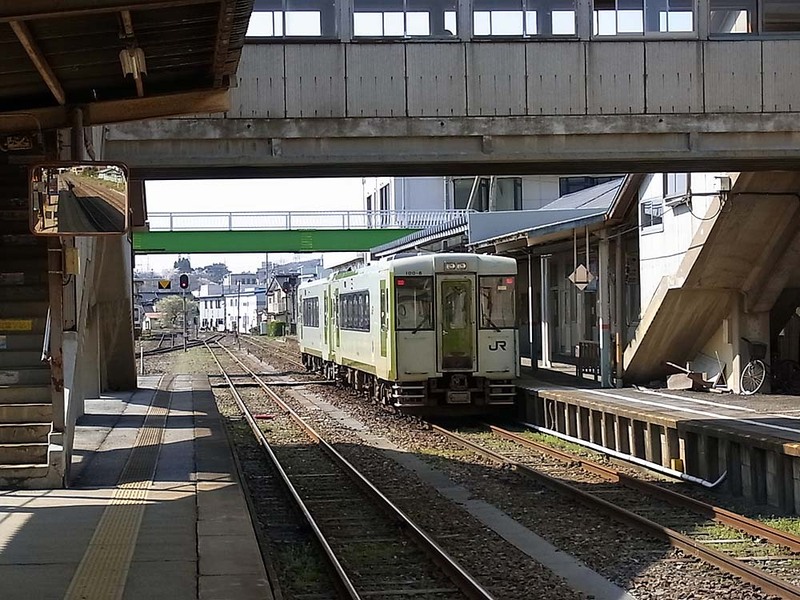 The train for Ichinoseki Station was waiting at the platform of the station. 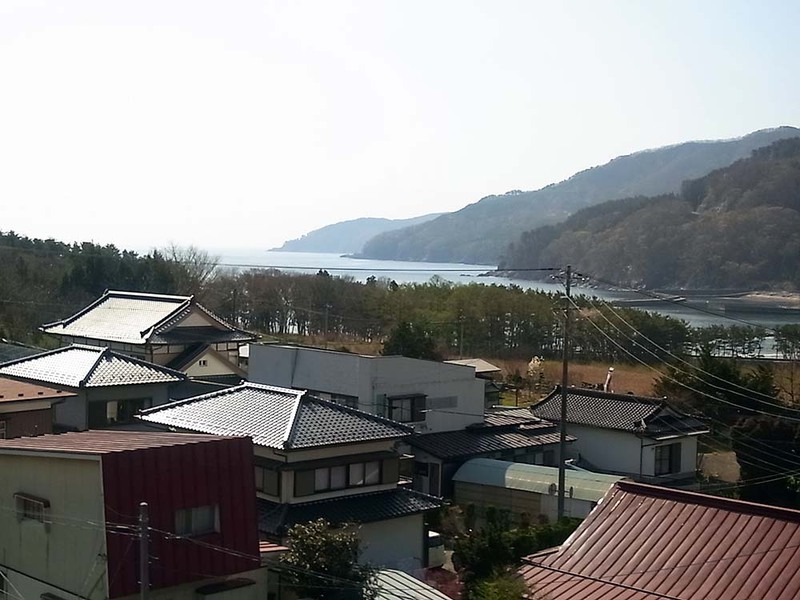 Ofunato port from the view of the inland area. 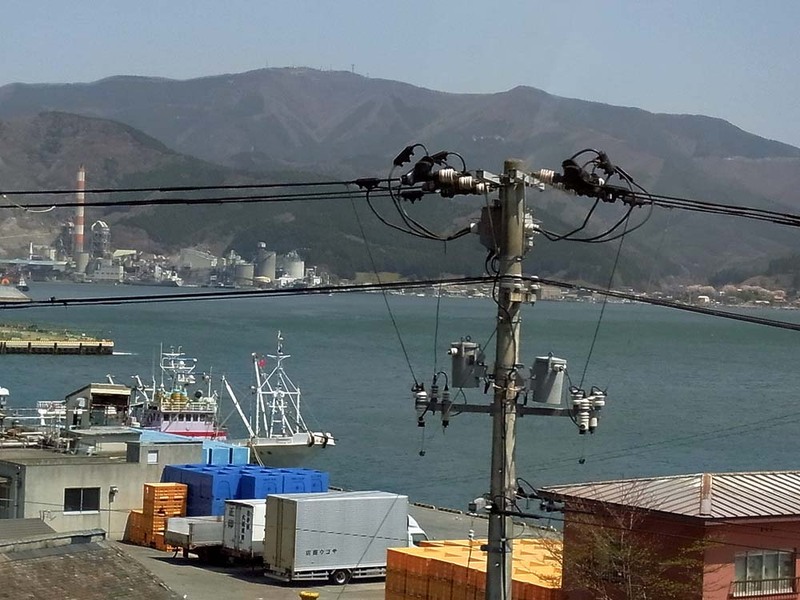 Mountains are in the opposite shore, and the port seems to be a big river. 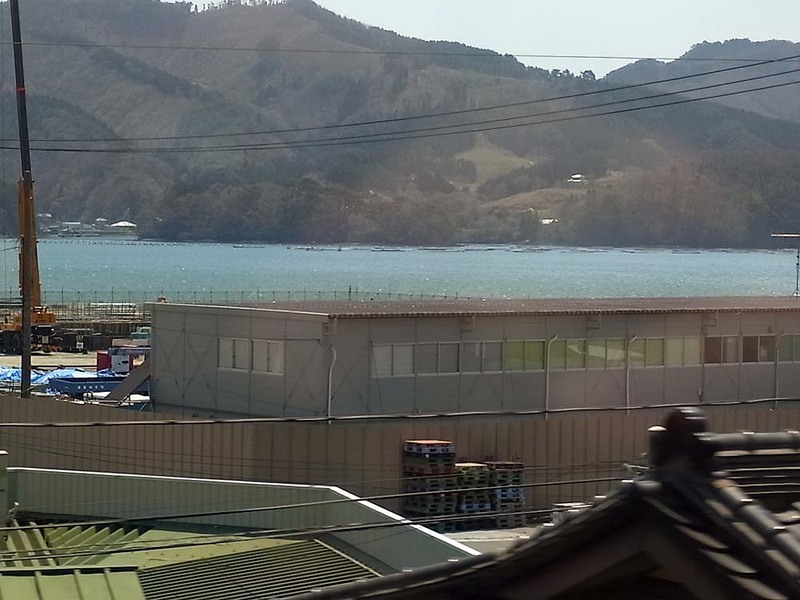 A view of Ofunato port seen from the train window. 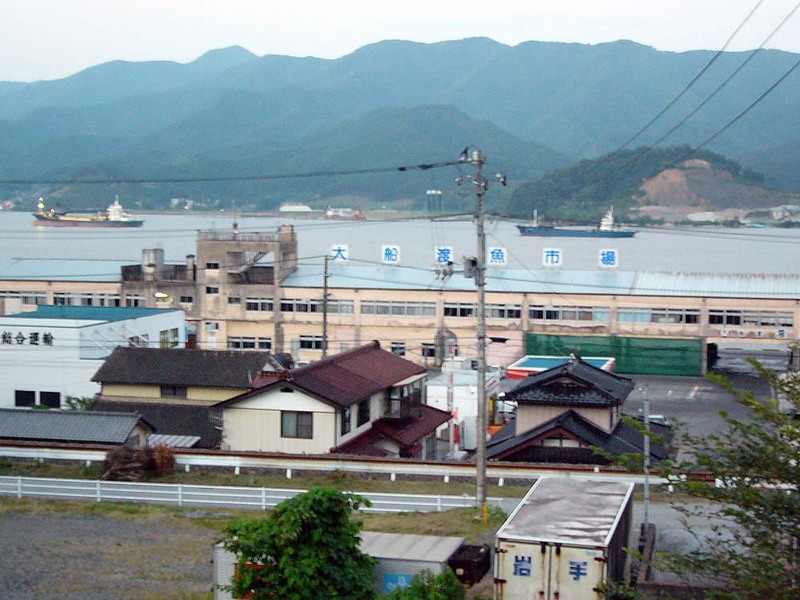 Many factories are built in the front side of the shore. 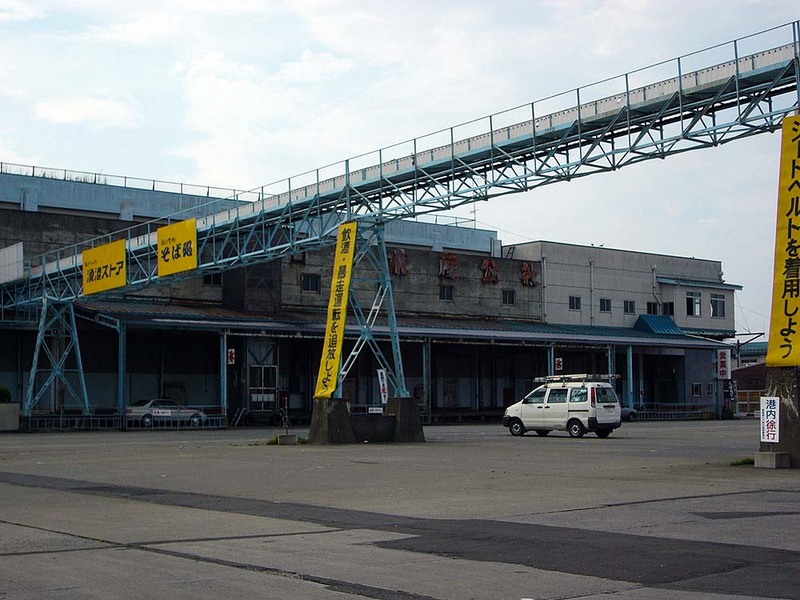 Ofunato port is an industrial port. Large ships come and go. 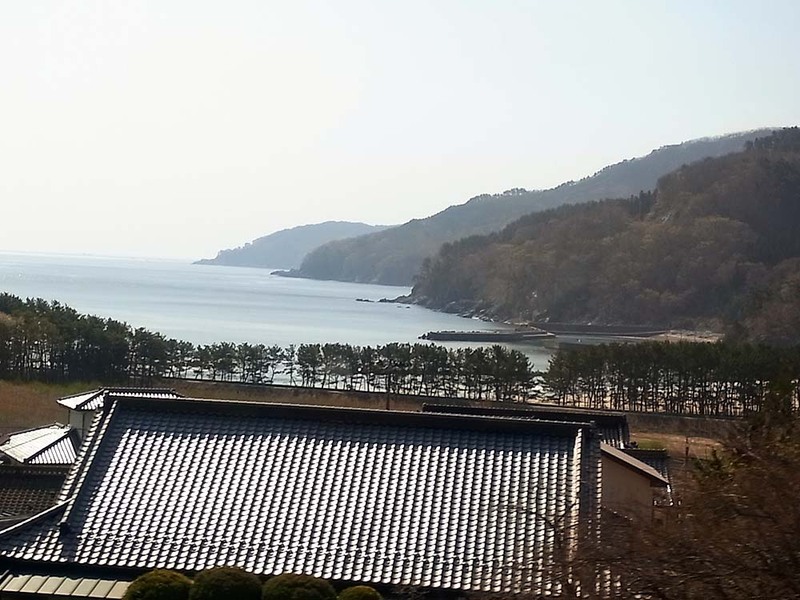 The sea in Ofunato. 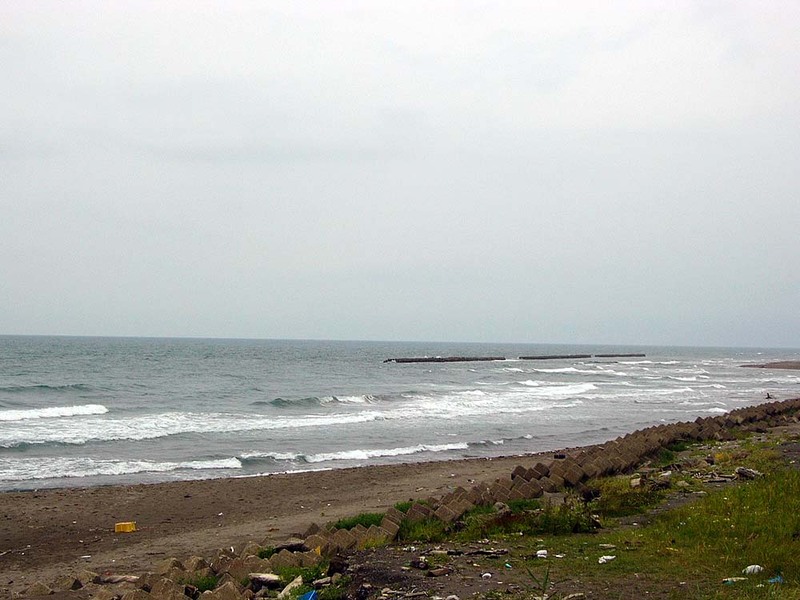 The sea is surrounded by land with complex shape. 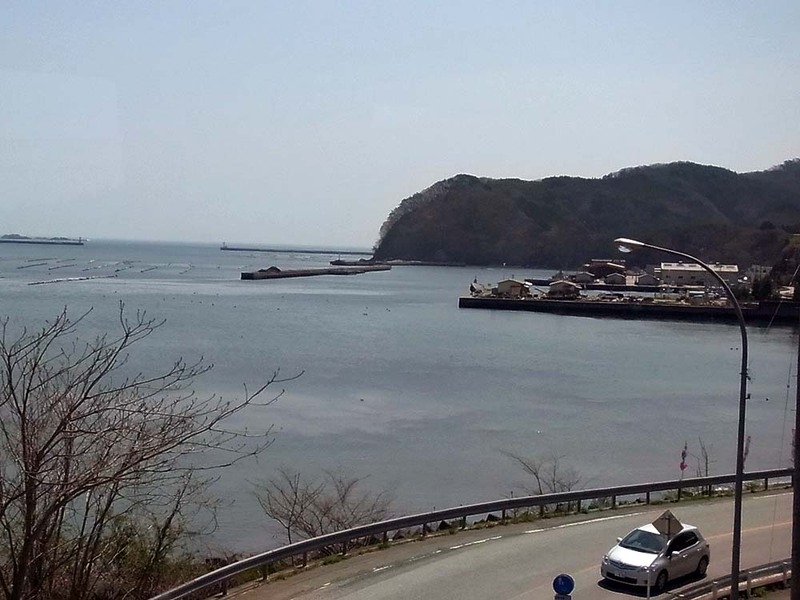 A scenery of the coastline on the way to Ichinoseki from Ofunato. 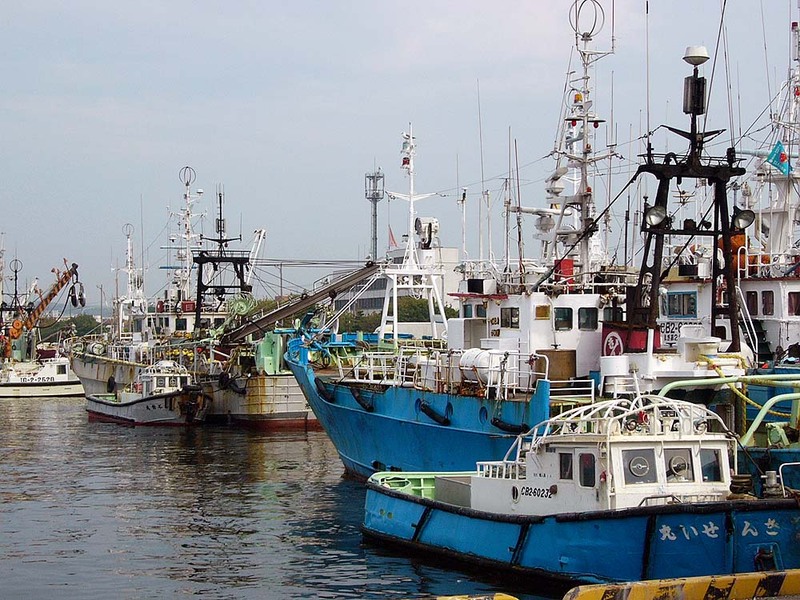 Since Hachinohe fishing port is a large one, a lot of large and small fishing boats had been anchored. 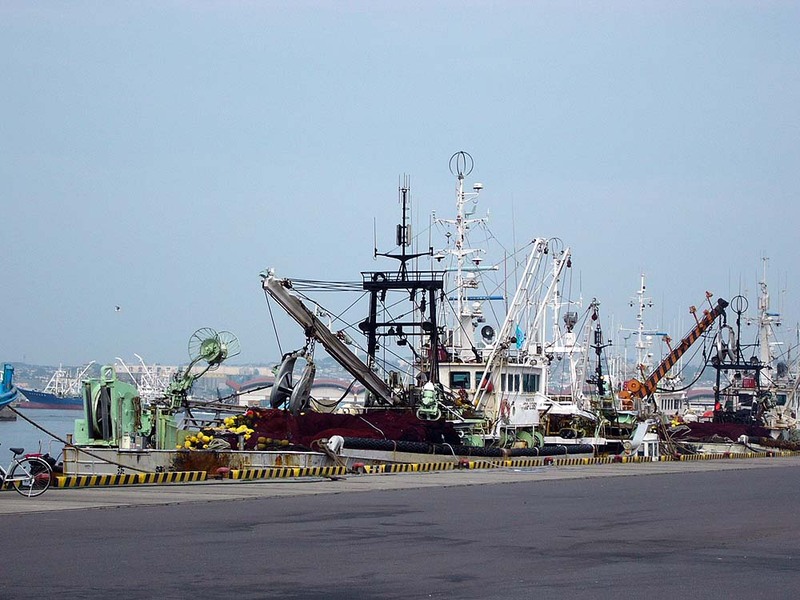 A scenery of the port quay. 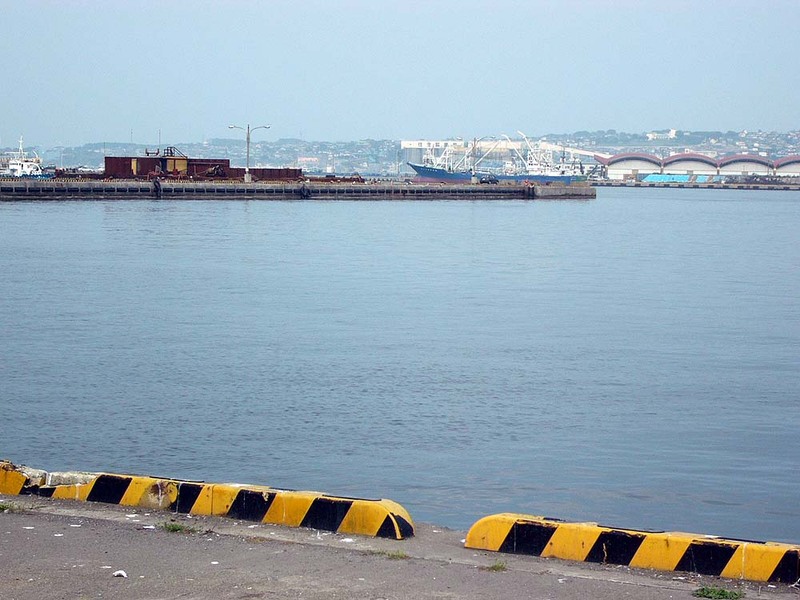 port facility is on the land side of the port. 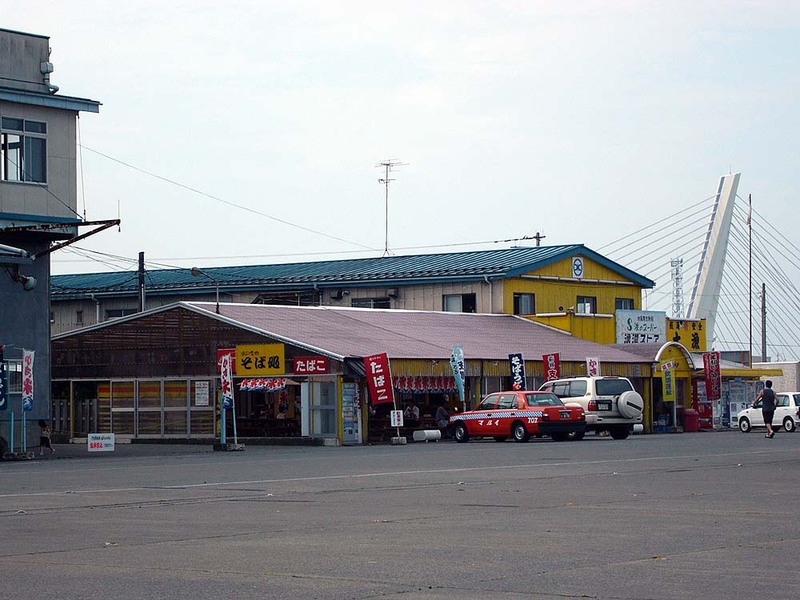 There is a food and drink shop in the port. 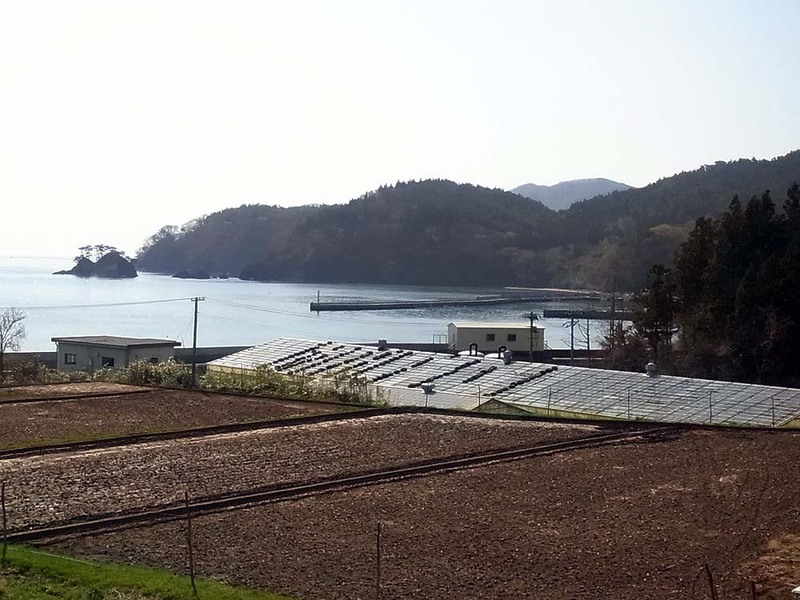 The parking lot of the black-tailed gull farming land near Hachinohe. 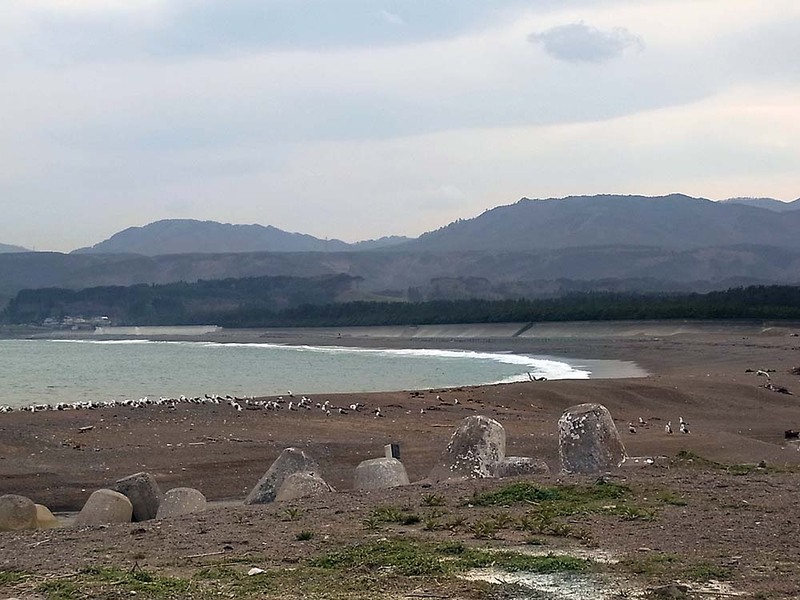 The mountain in the upper right of this photo is the black-tailed gull farming land. 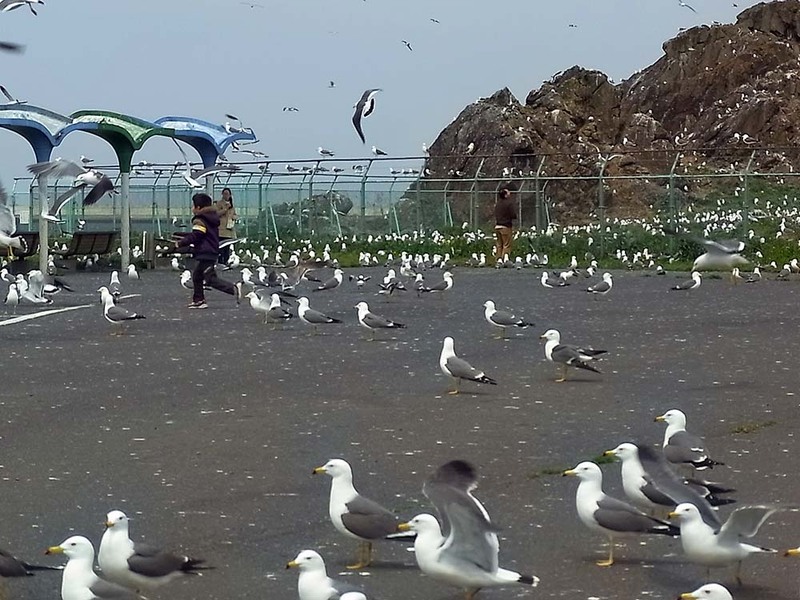 The surface of the mountain had been filled with black-tailed gulls. 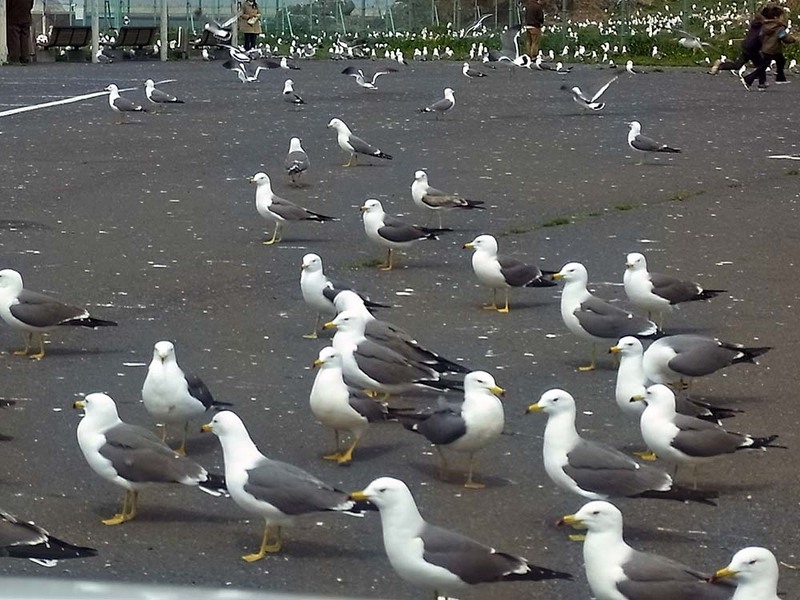 Also, the parking lot was occupied by many black-tailed gulls. 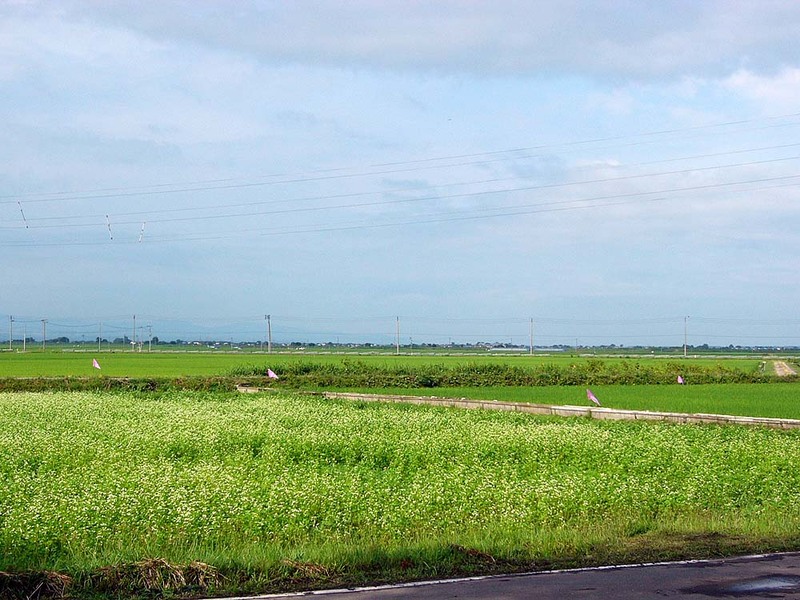 A landscape of countryside on the way to Aomori from Hachinohe. 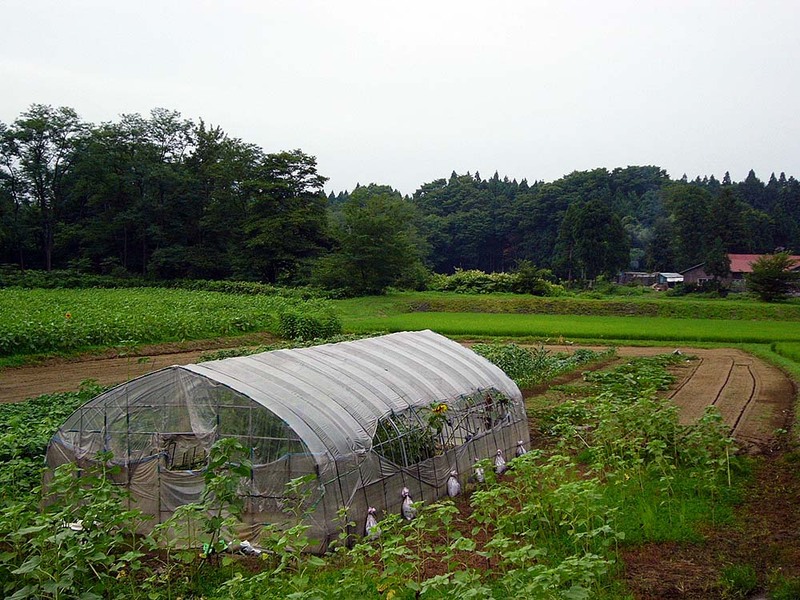 A farm in the small wood in Aomori. 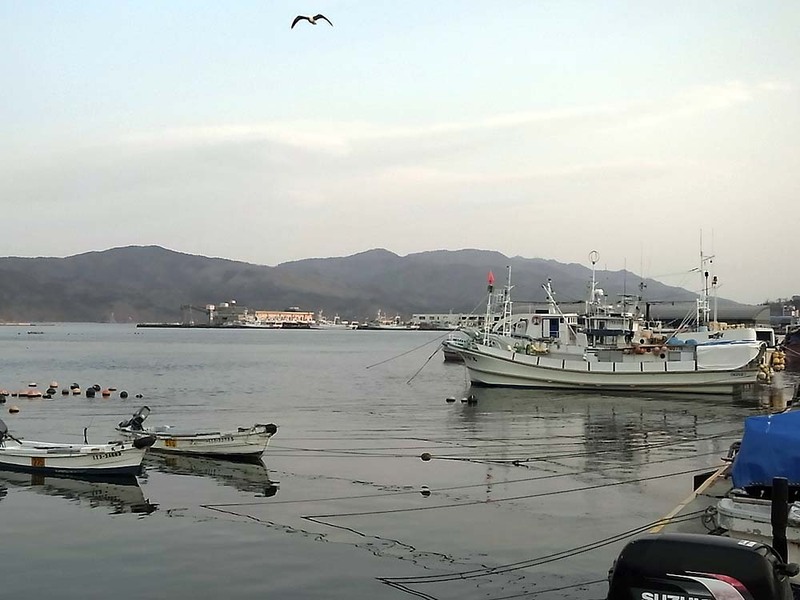 The sea seen from Noheji fishing port is the northernmost sea of the main island of Japan. 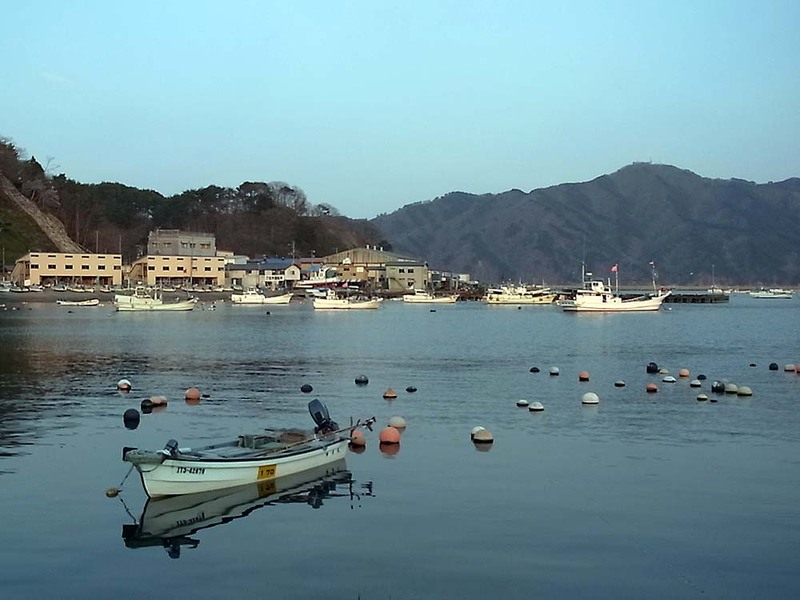 A scenery of Noheji fishing port in the evening after the rain. 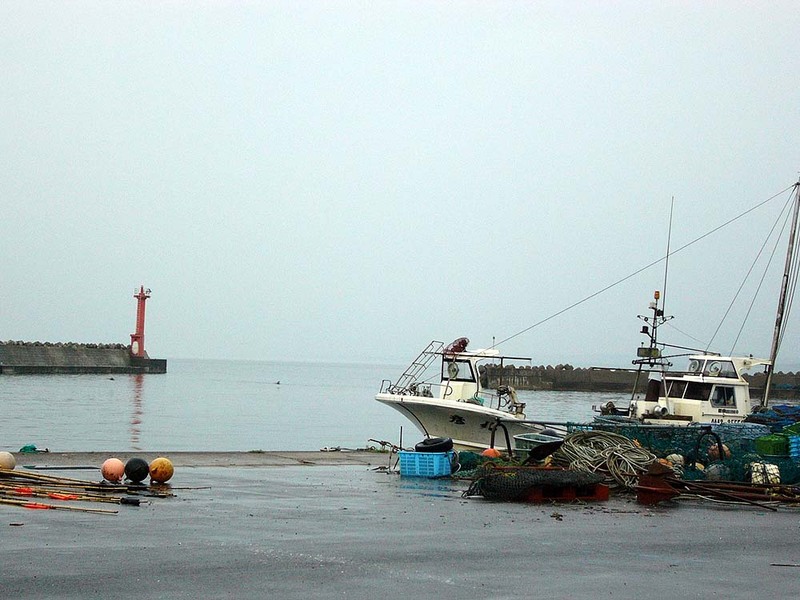 Many fishing boats had been anchored in the fishing port. 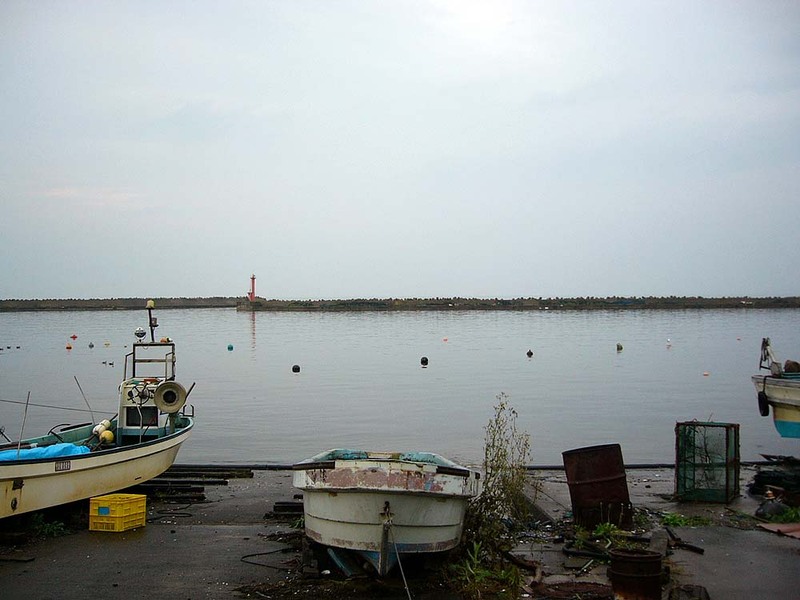 The silent sea seen from the fishing port in the evening after the rain. 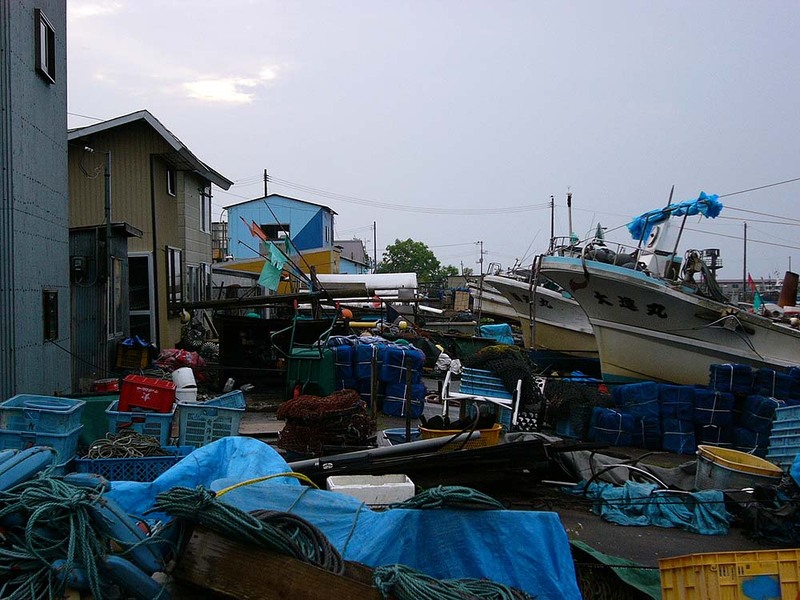 The work area of the fishing port. 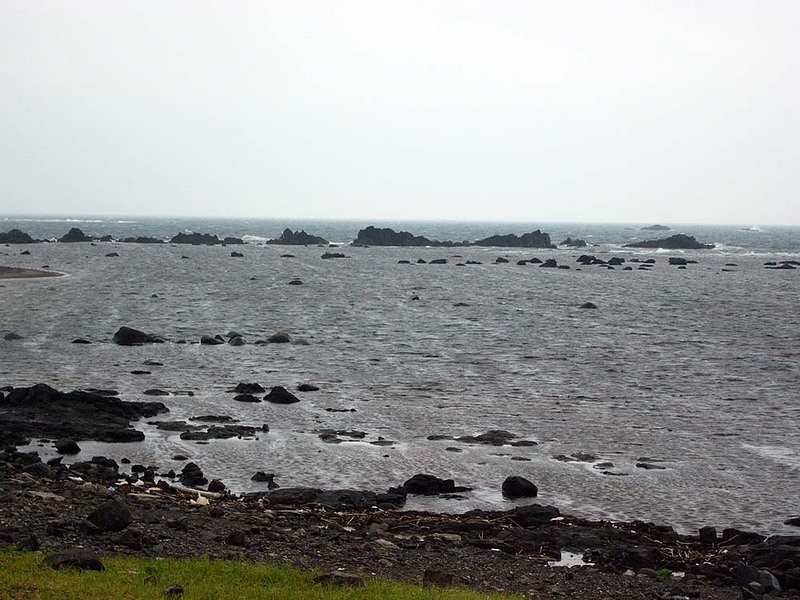 The northernmost sea of the main island of Japan. 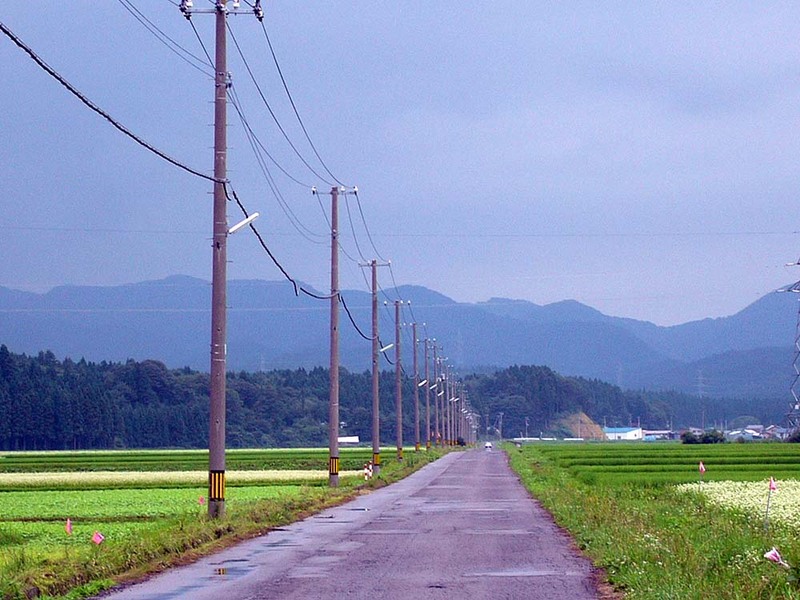 Far ahead is Hokkaido. 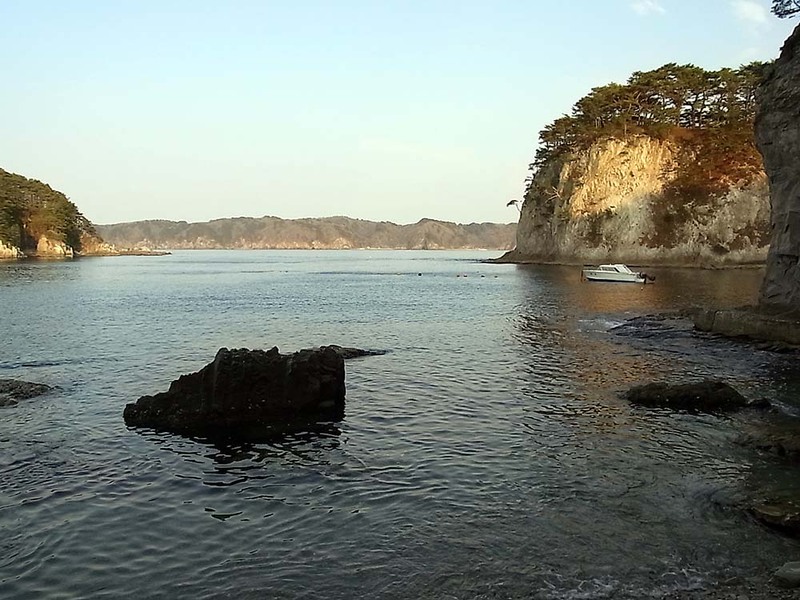 Yuno-shima islet seen from Asamushi Onsen coast. 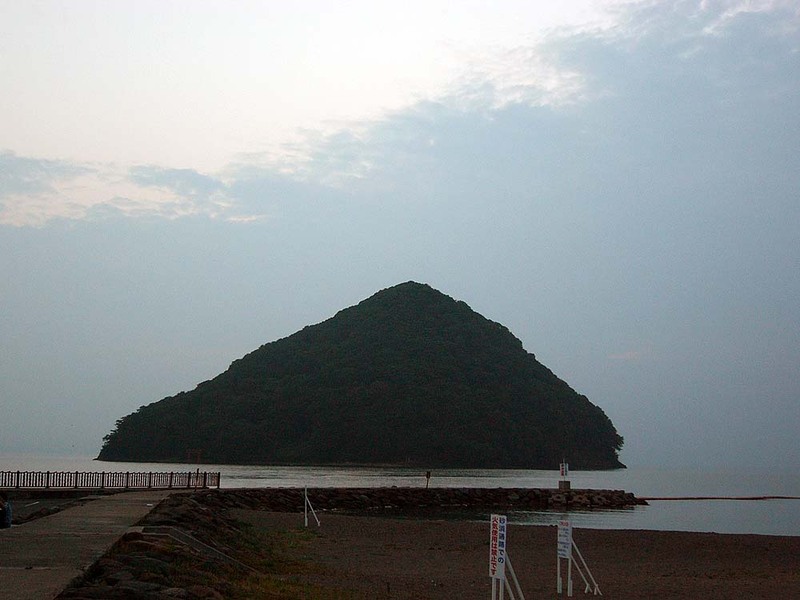 The islet in the shape of triangle is interesting. 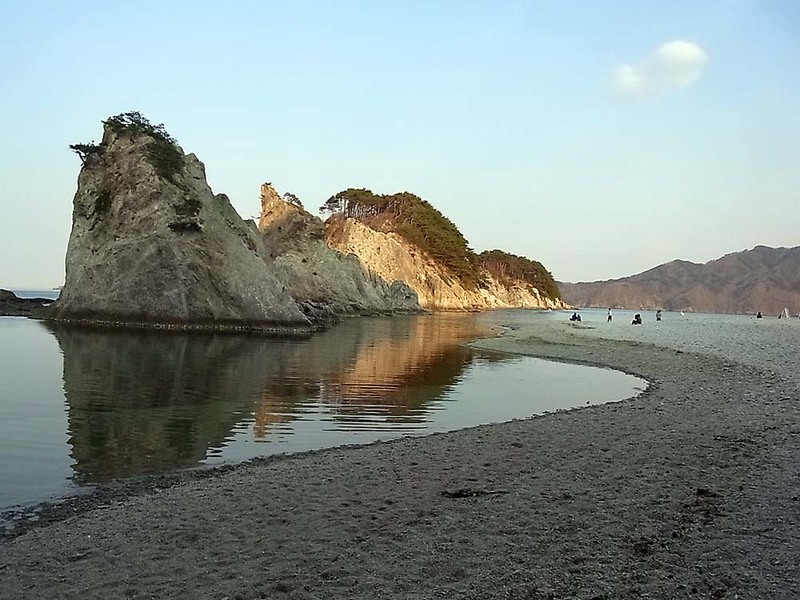 Sandy beach in Asamushi Onsen at sunset. 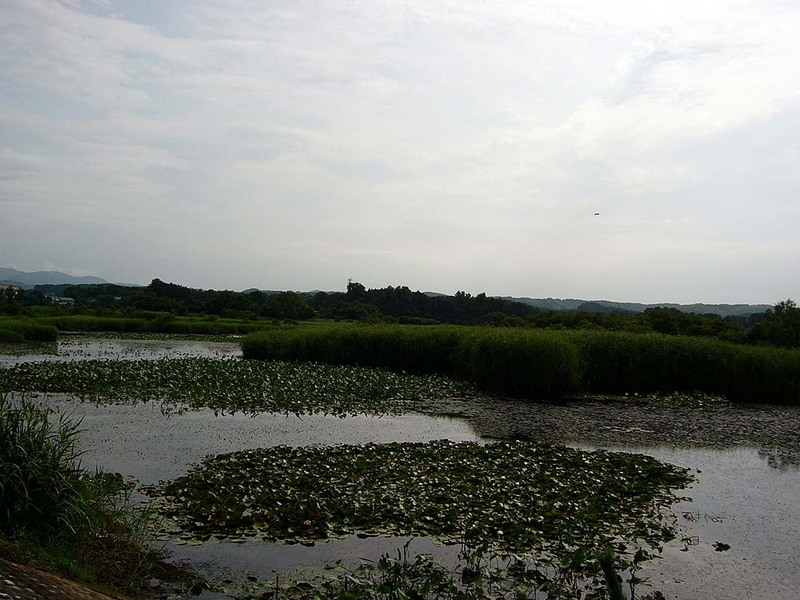 There are many wetlands in Tsugaru region. The wetland has small plants on the surface of the water. 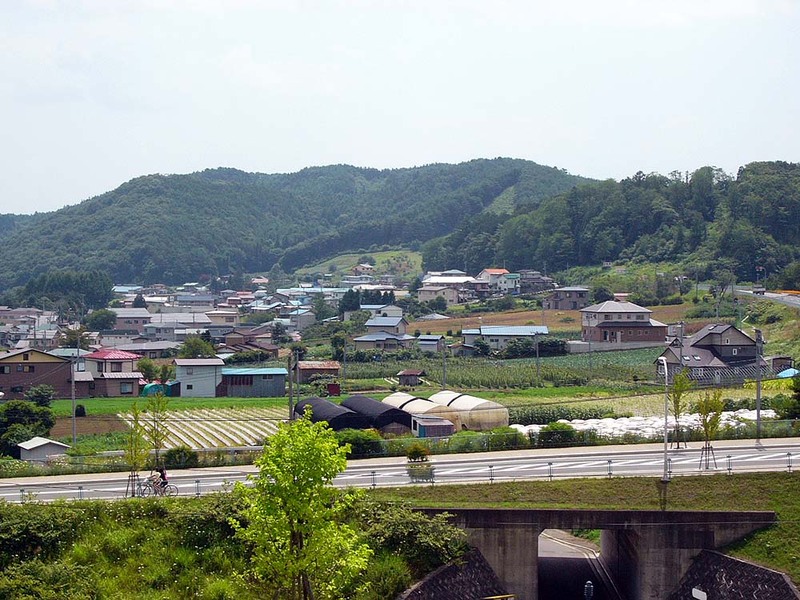 Another landscape of Tsugaru countryside. 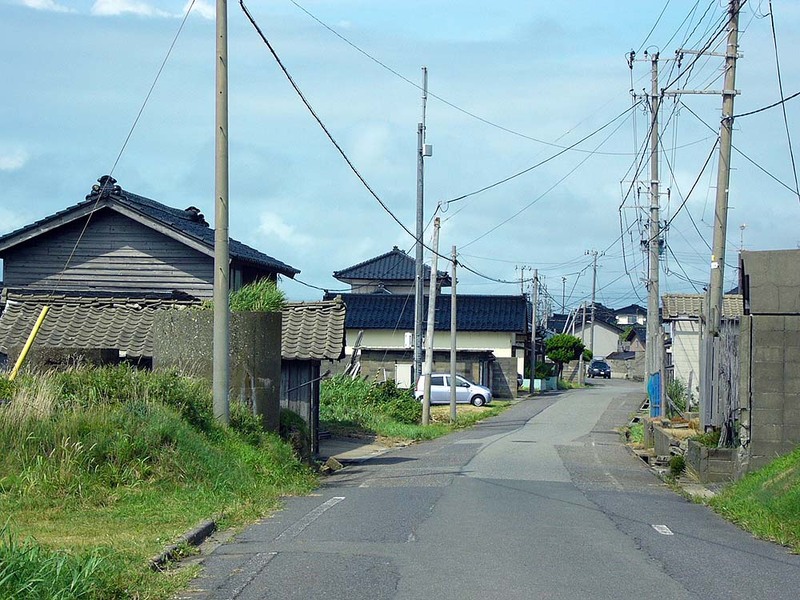 One photo that was taken in the countryside of Tsugaru. 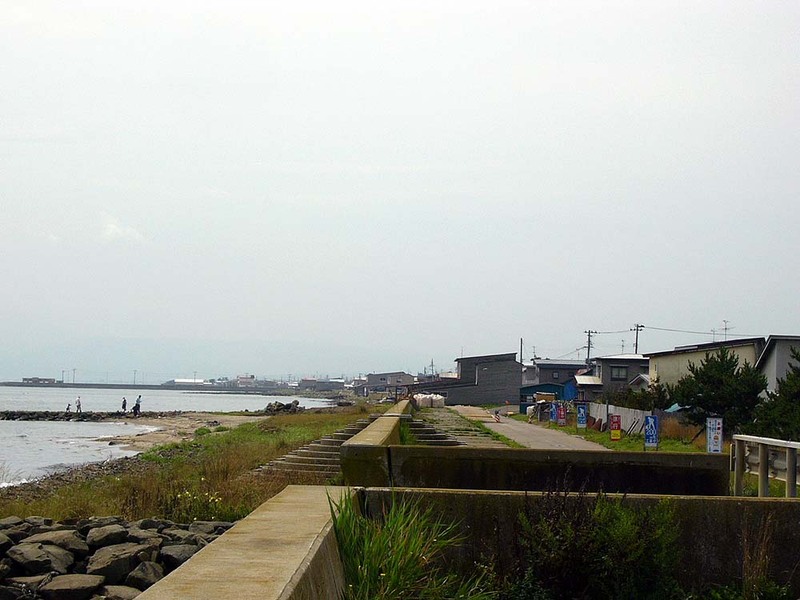 The east side coastline in Tsugaru region. 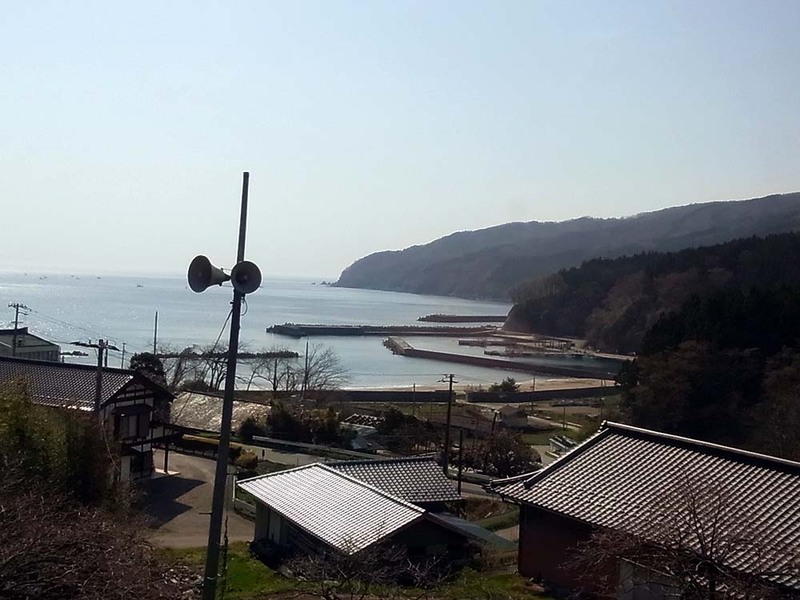 Another view of the east side coastline in Tsugaru region. 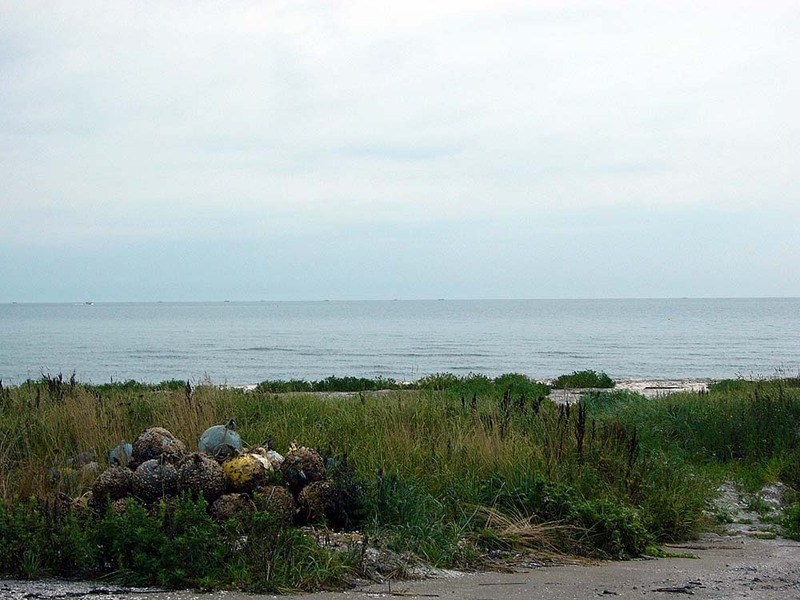 The sea seen from the coastline. 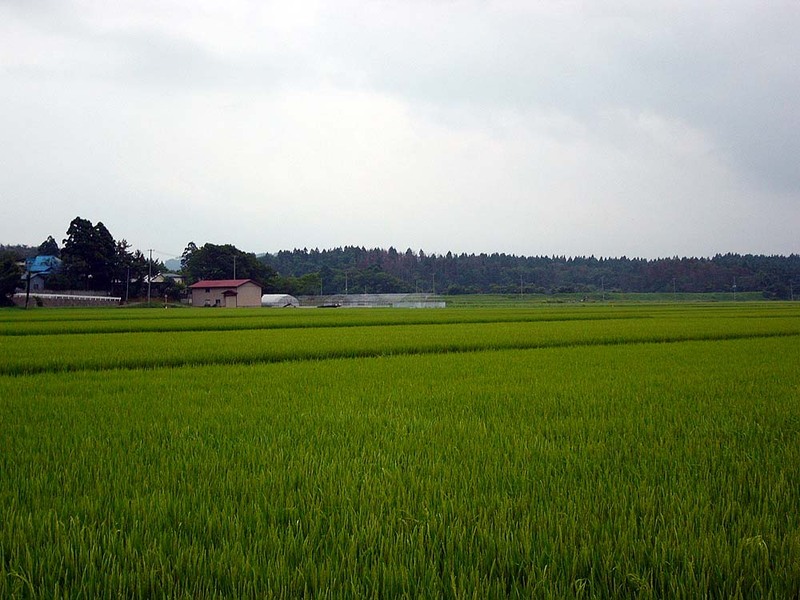 A landscape of countryside in Tsugaru. 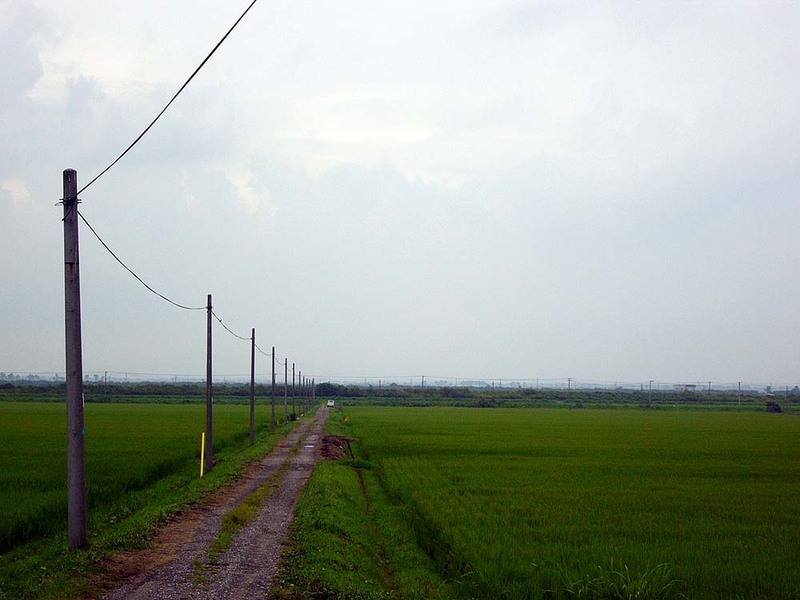 The utility poles stand in line until far away. 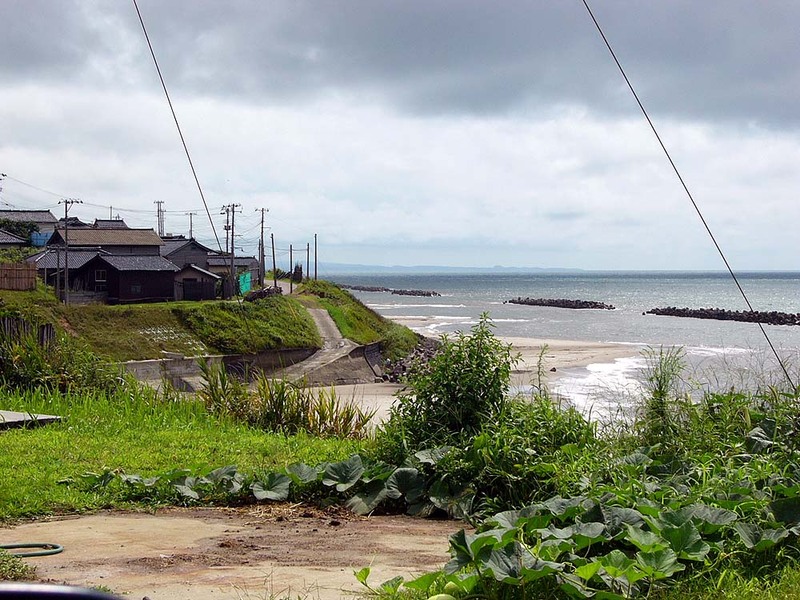 The Sea of Japan seen from the coastline in Aomori. Strong wind was blowing. 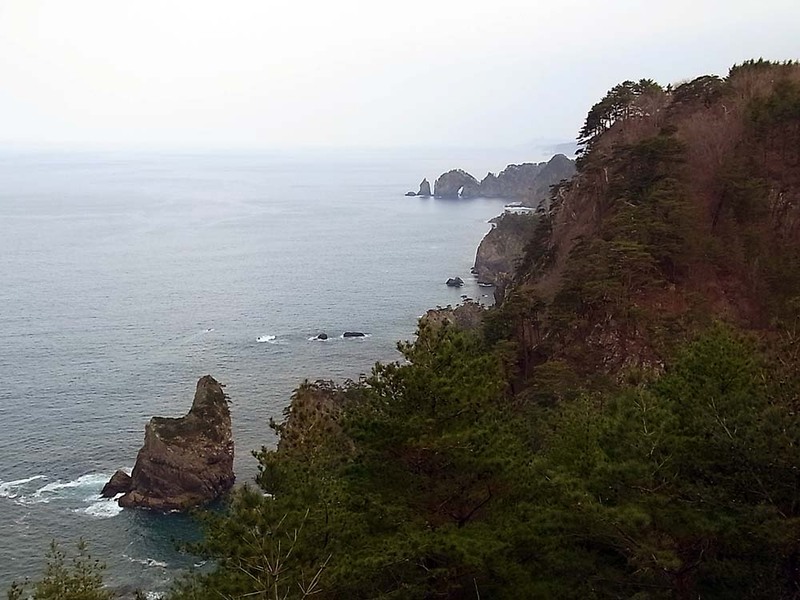 Another view of the coastline facing the Sea of Japan. 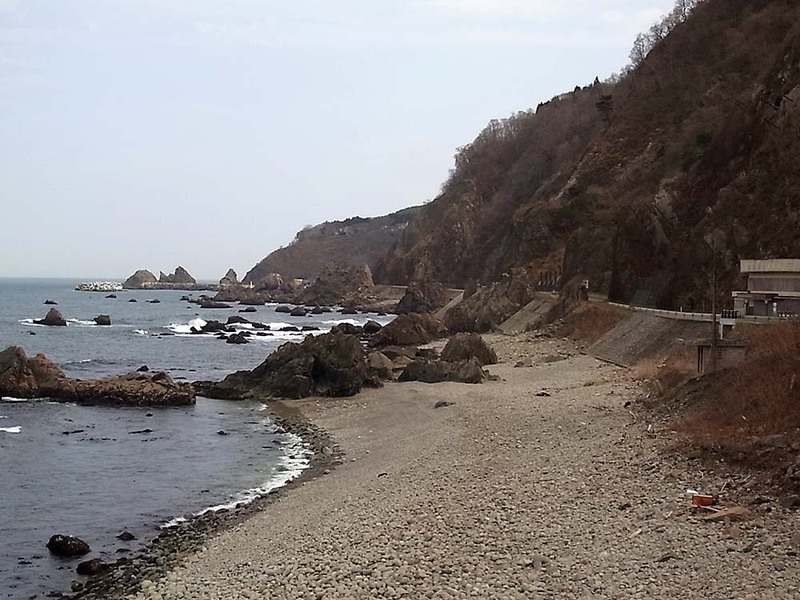 A scenery of the coastline on the way to Akita along the Sea of Japan. 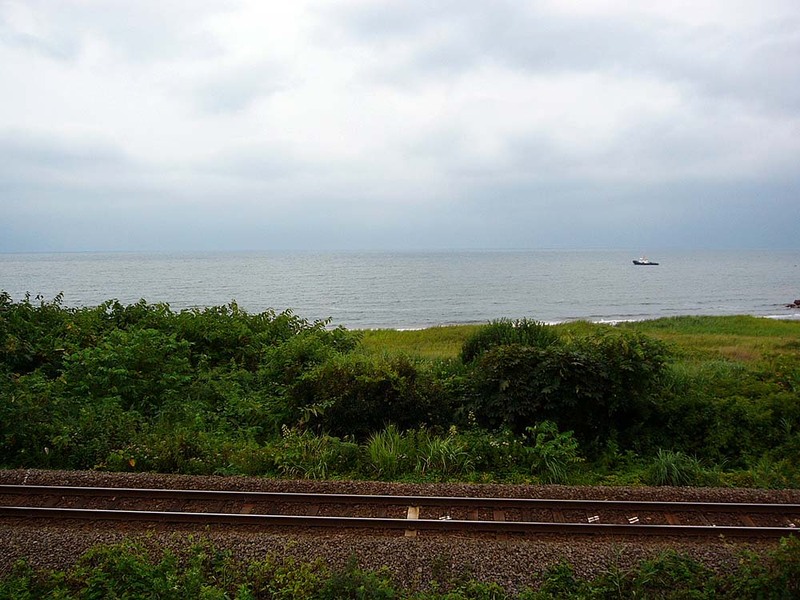 There is a single line of railway just inside the coastline. 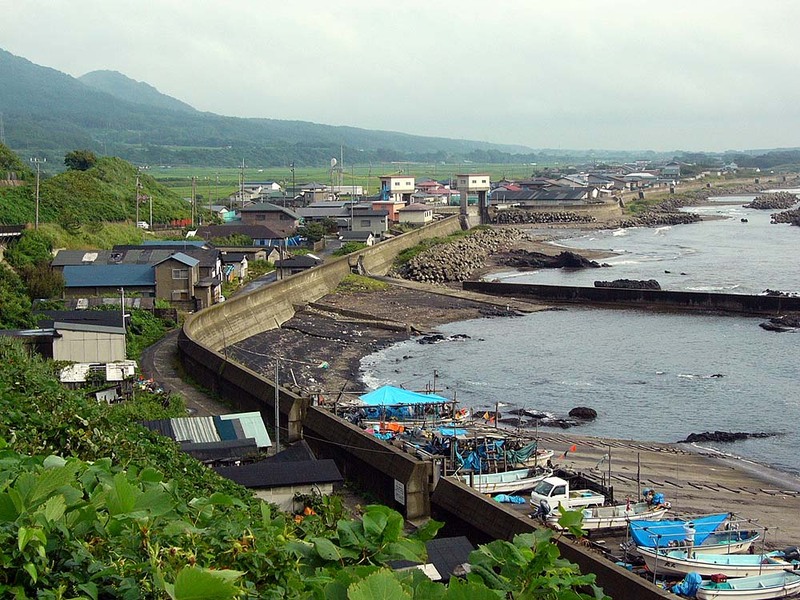 If you run the coastal highway, you would sometimes find fishing towns in the low plain of the coastline. 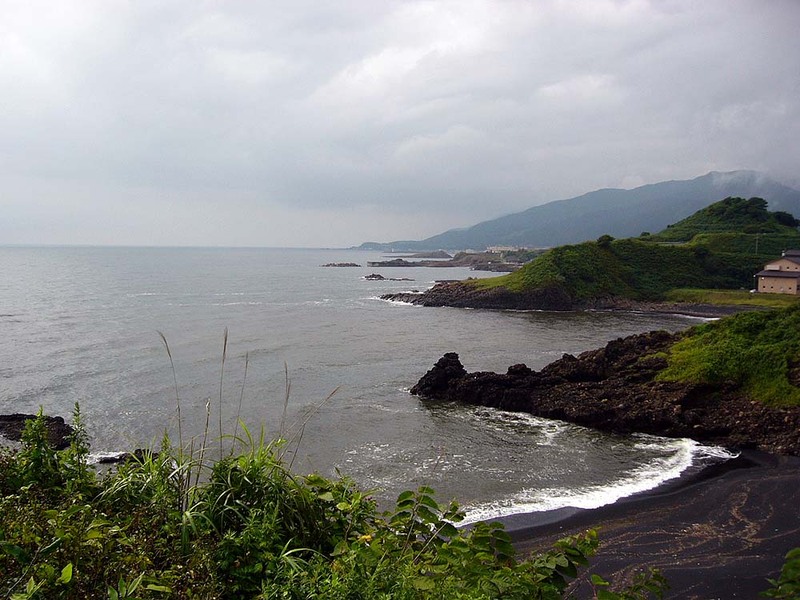 Senjojiki Coast. 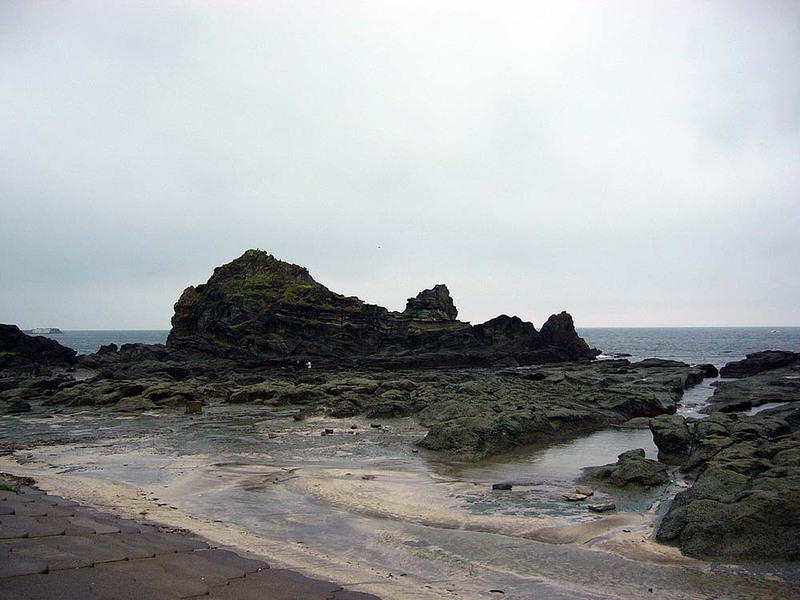 Many dark rocks are rugged from the sea. 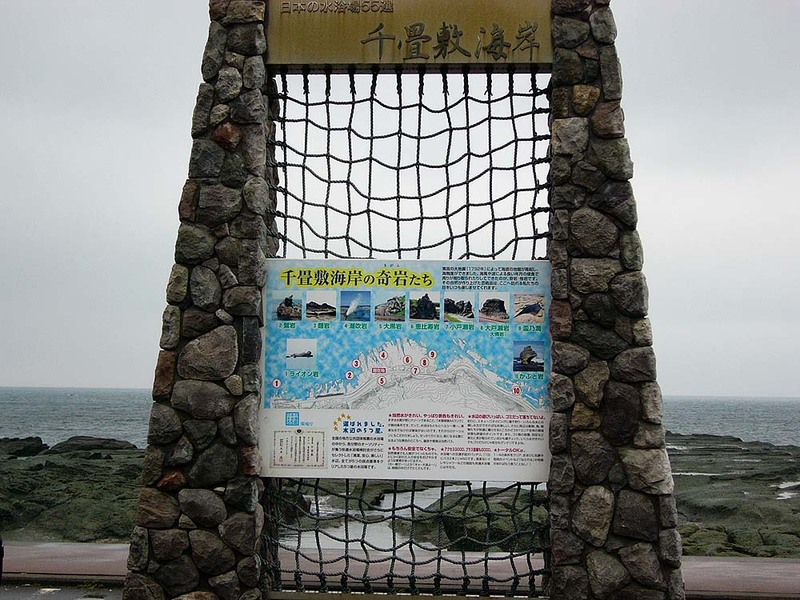 Senjojiki Coast tourist information board. 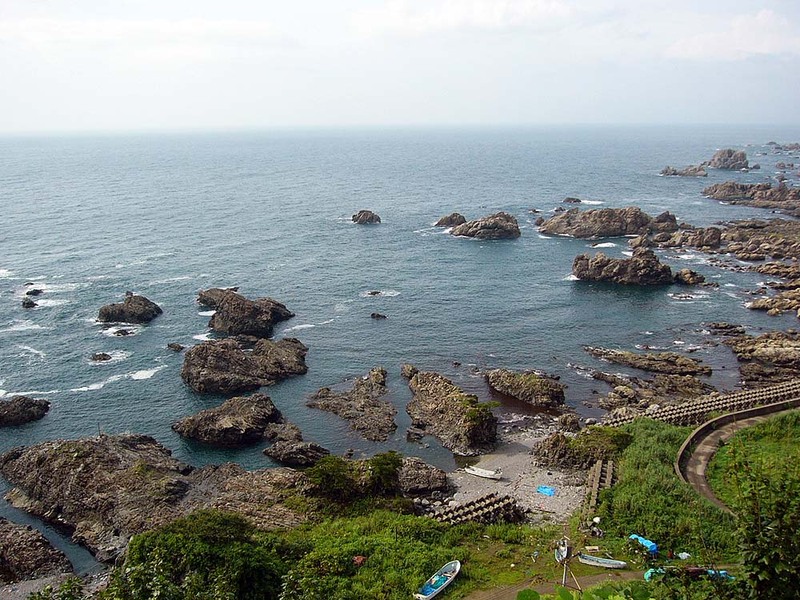 Senjojiki Coast has a unique scenery. 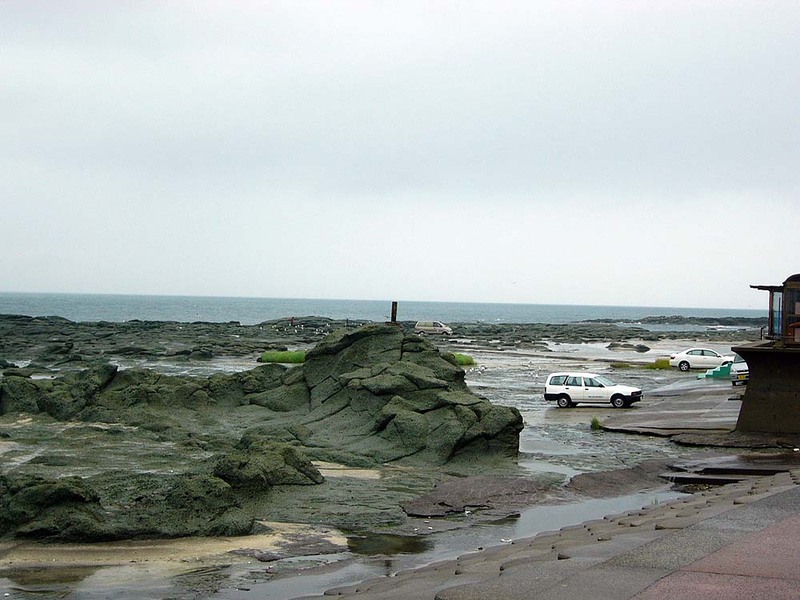 As compared with the car, the size of the rocks can be seen. Sunlight is reflected on the rocks and the sea, and a unique light and dark is created. 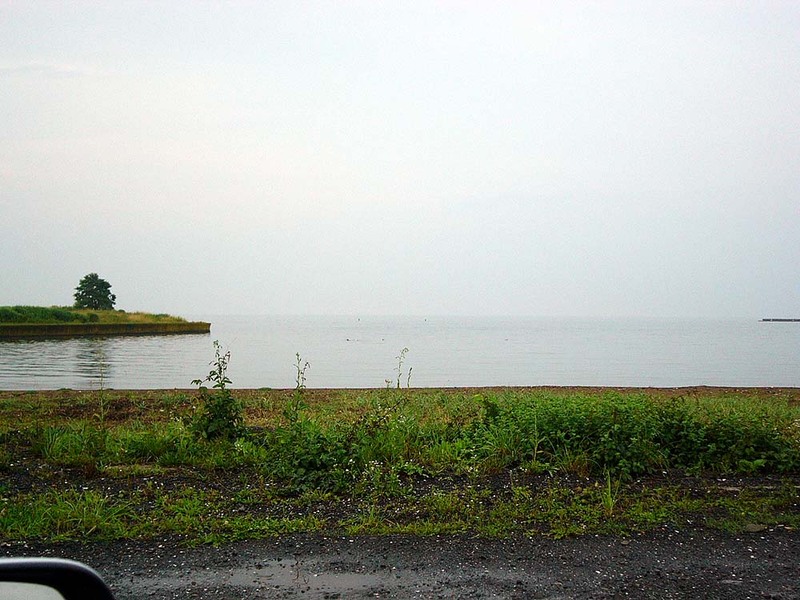 A scenery of the coastline in Aomori. 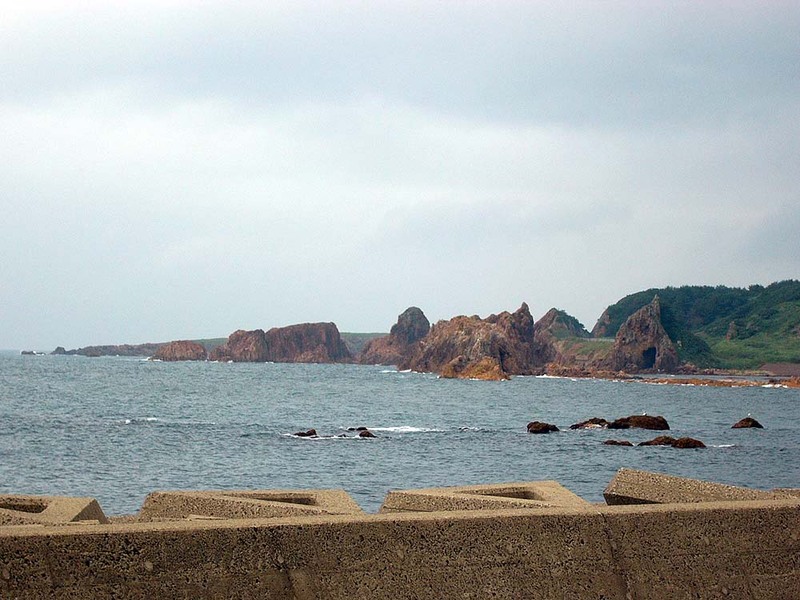 A complicated coastline and the Sea of Japan seen from the main road. 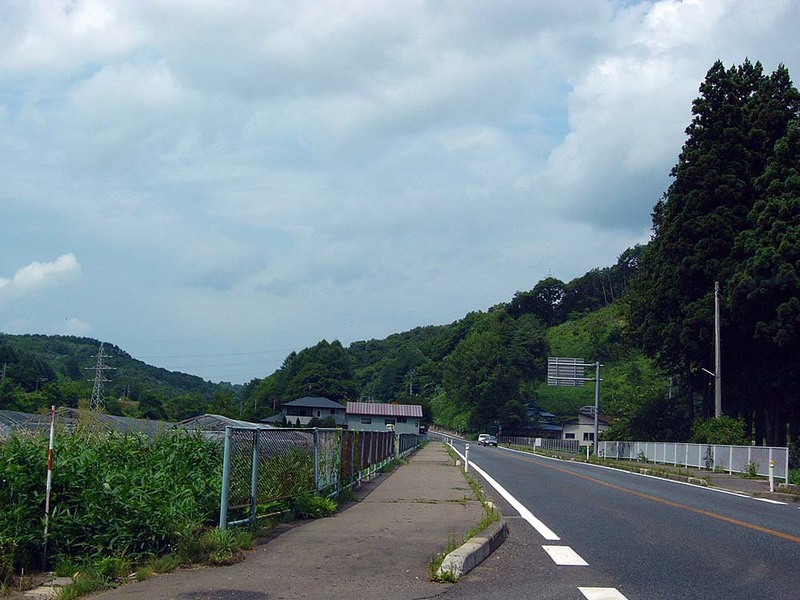 The inland side is a steep slope of mountains. 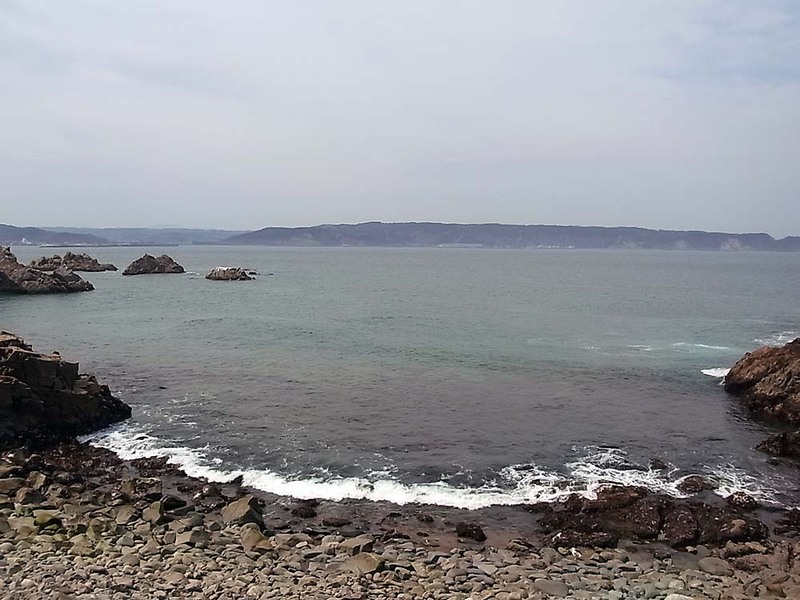 Another view of the coastline. 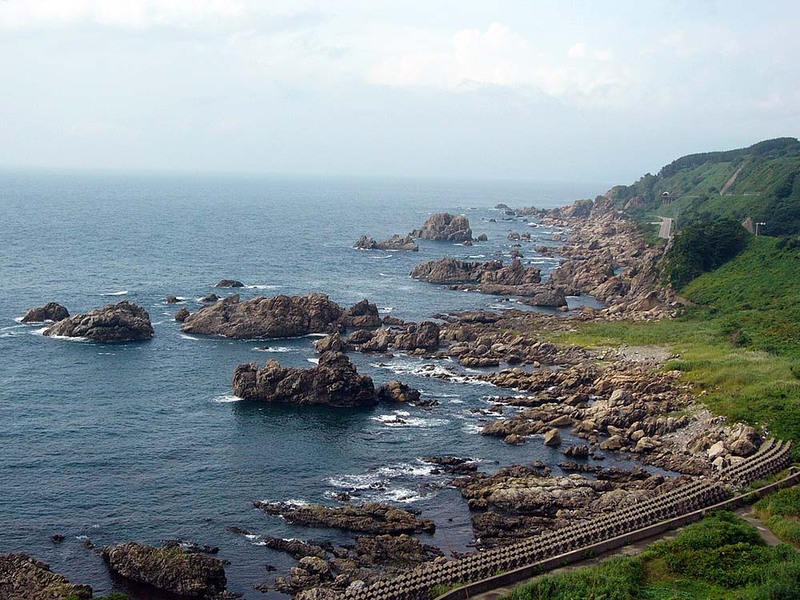 A complicated coastline along the Sea of Japan in Akita. 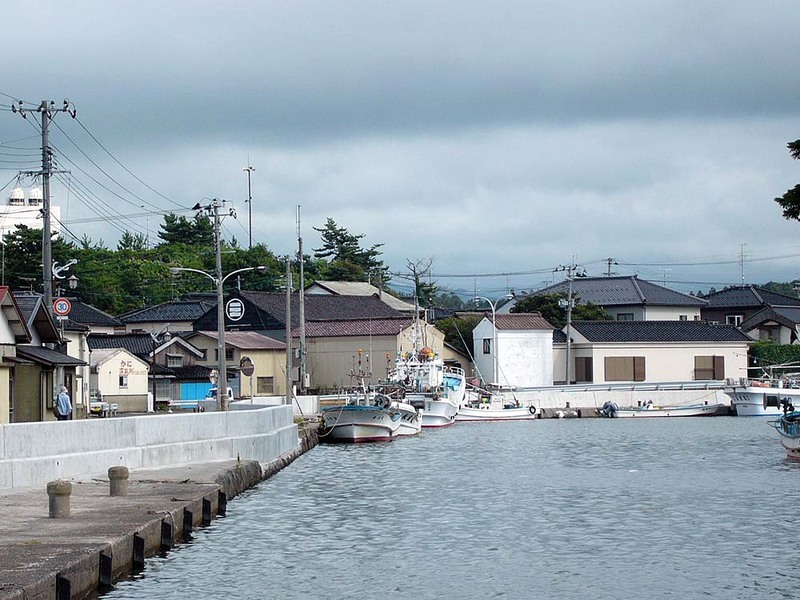 A small fishing port I found from the main road. 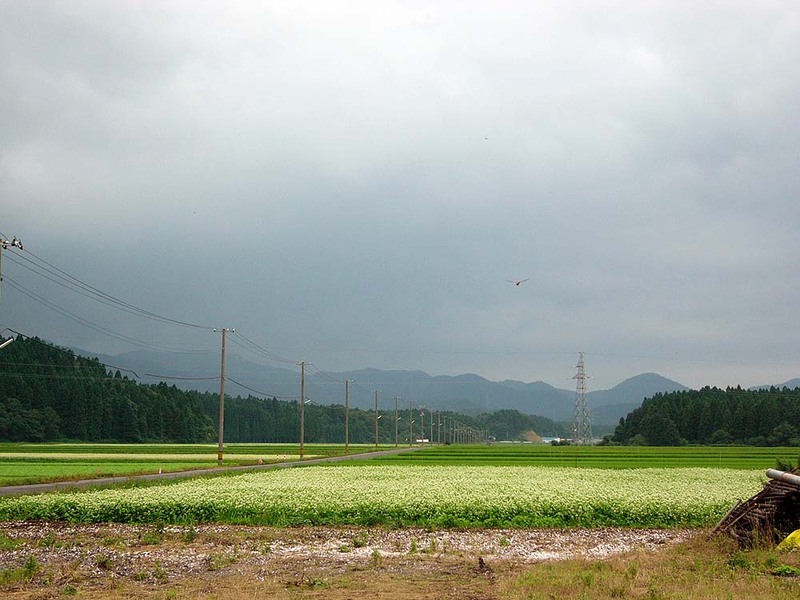 A scenery of the countryside in Akita. 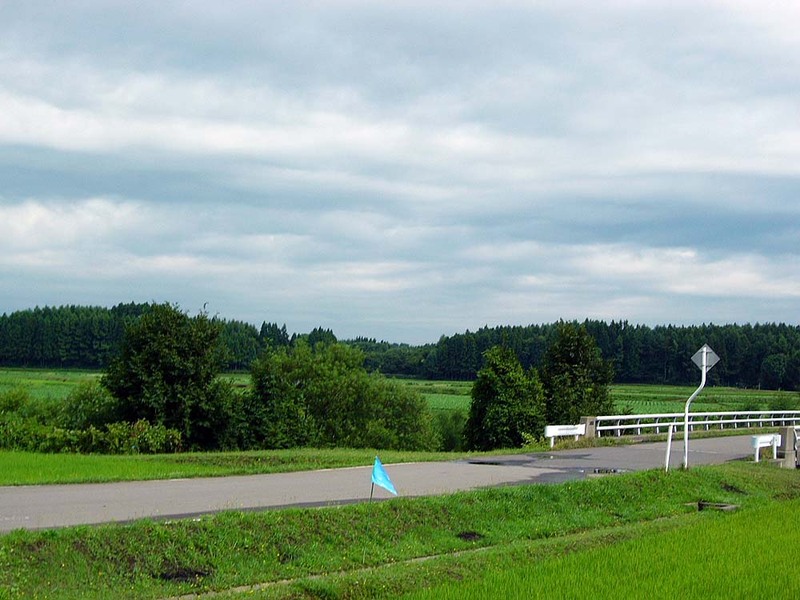 Another scenery of the countryside in Akita. 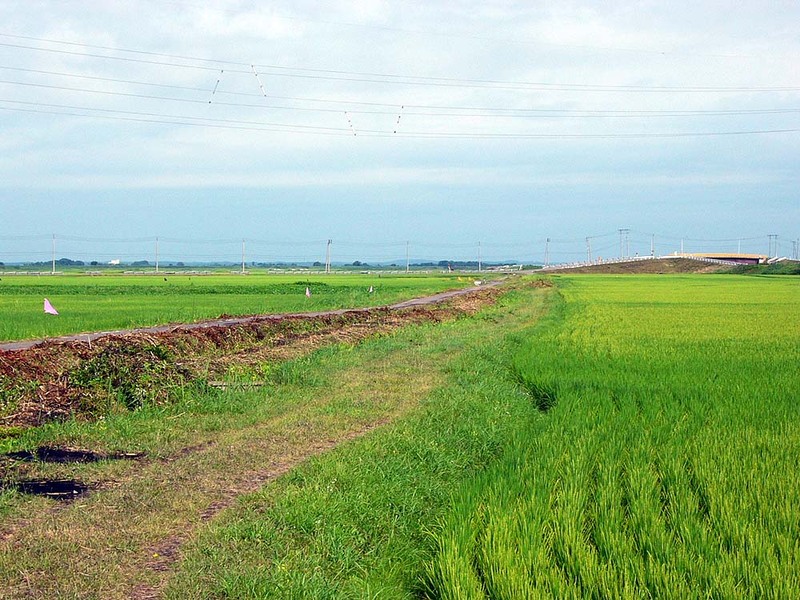 Countryside scenery is continues far away in the broad plain. The poles also seems much followed far. 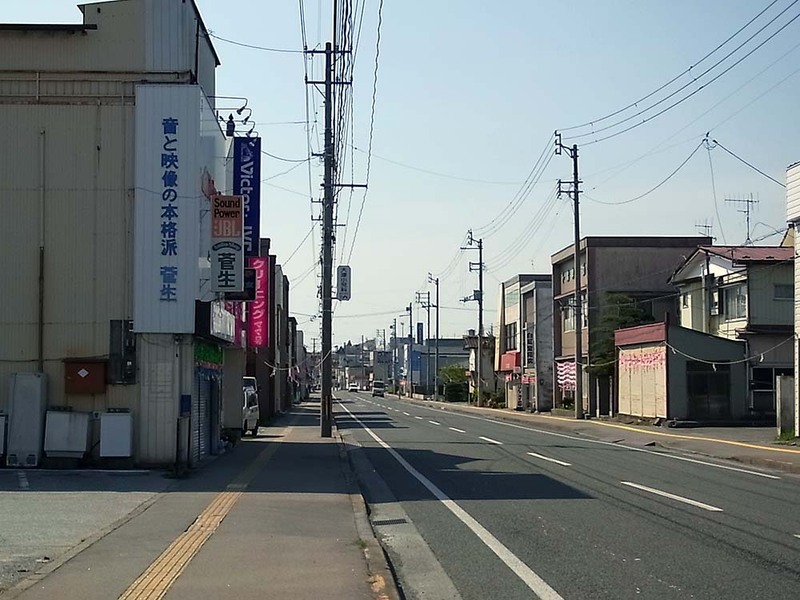 The main street in front of Ugohonjo Station. 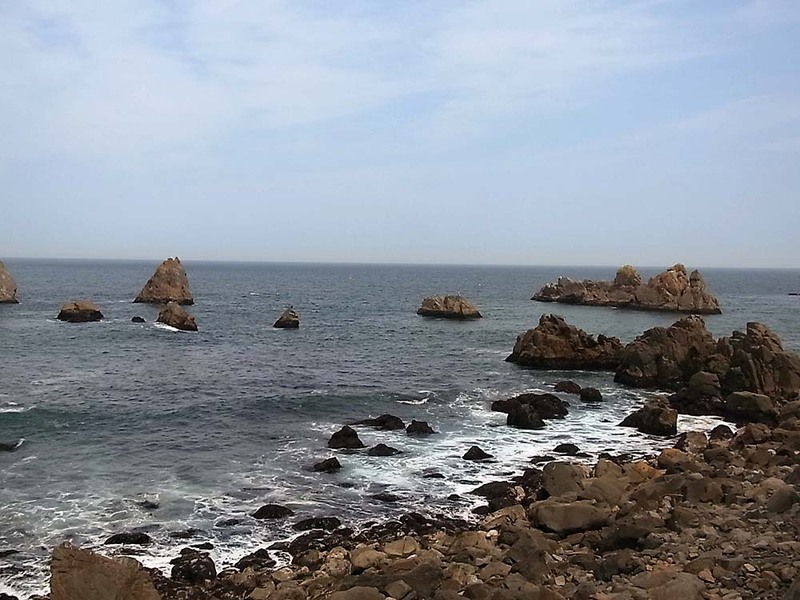 The Sea of Japan seen from the coastline in Akita. A coastline scenery in Akita. 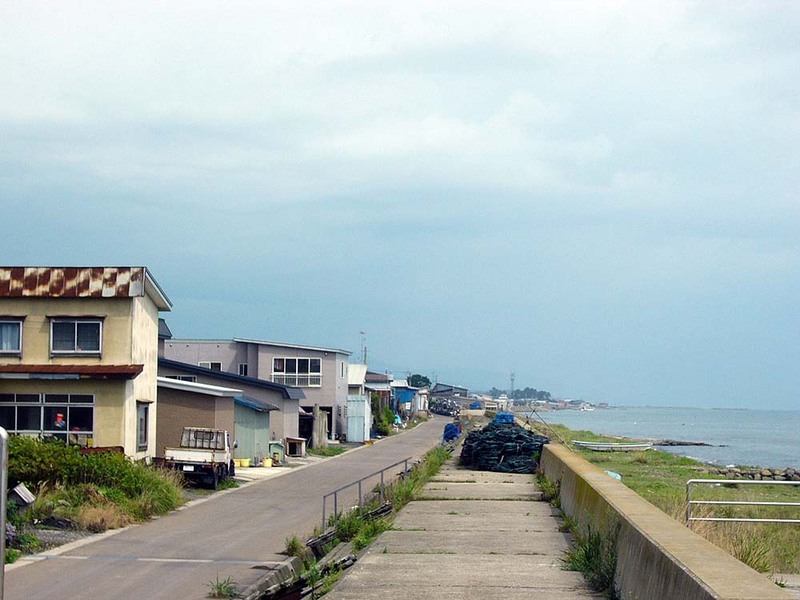 The sea and houses seen from the main road. 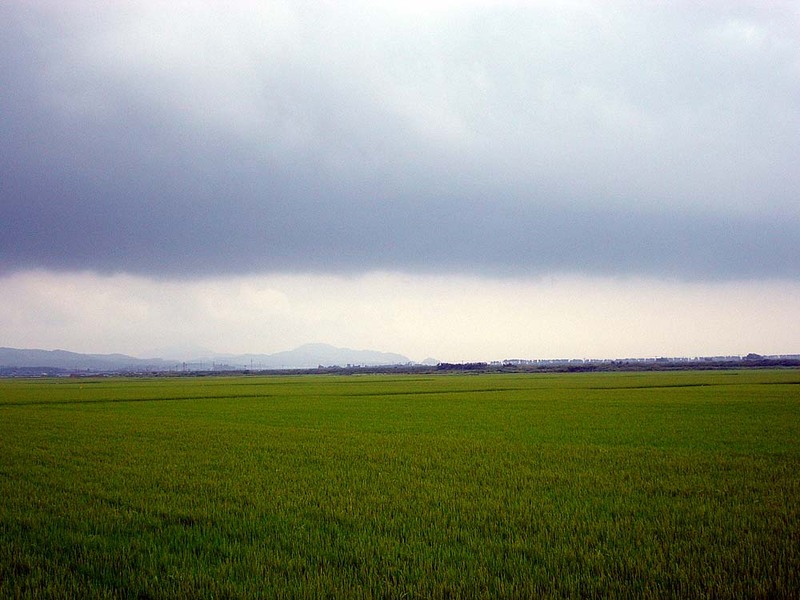 A landscape in the inland side. 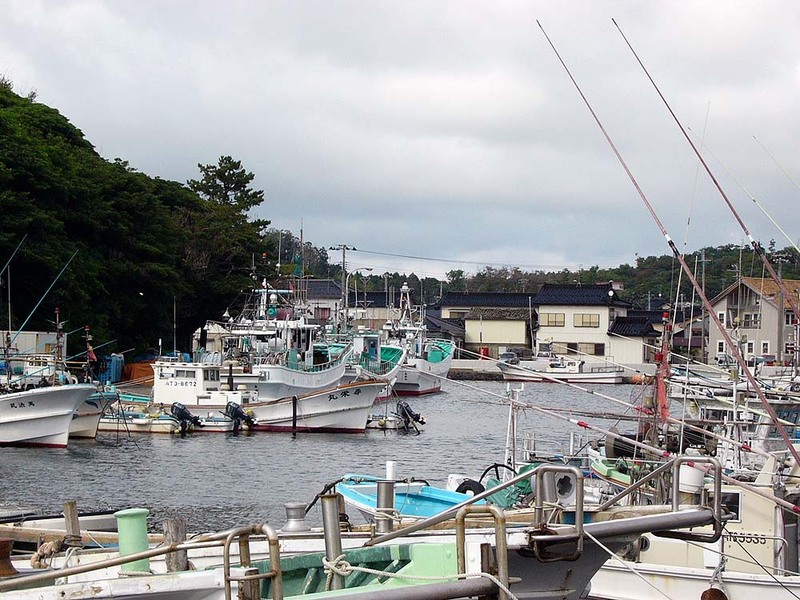 A fishing port that was stopped at on the way. 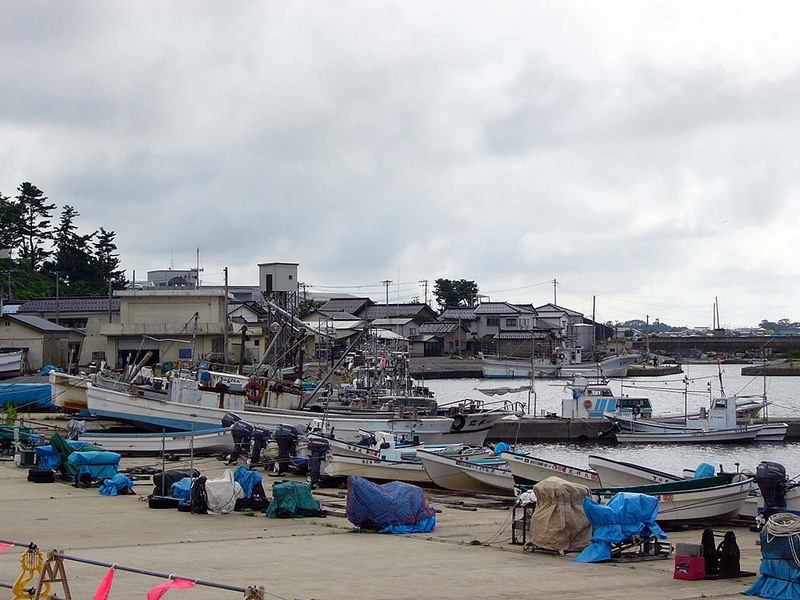 Another fishing port that was stopped at on the way. 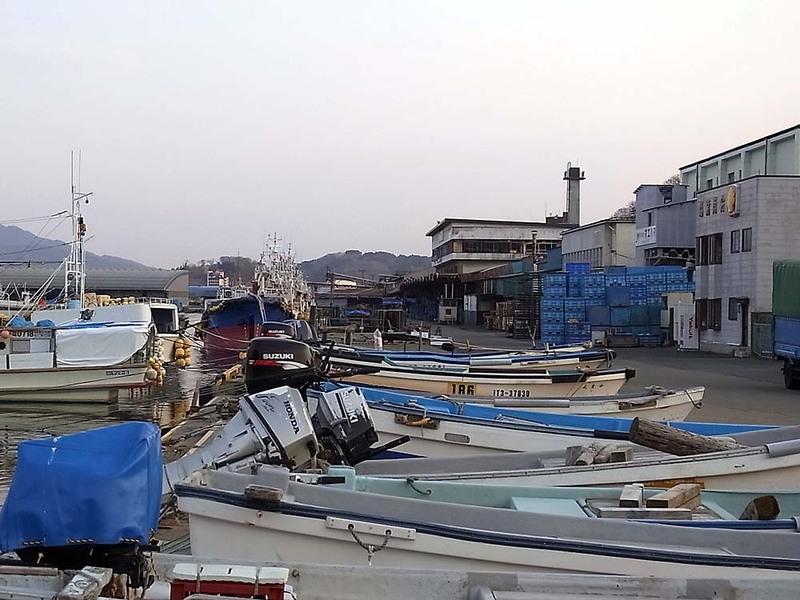 The fishing port was full of fishing boats. 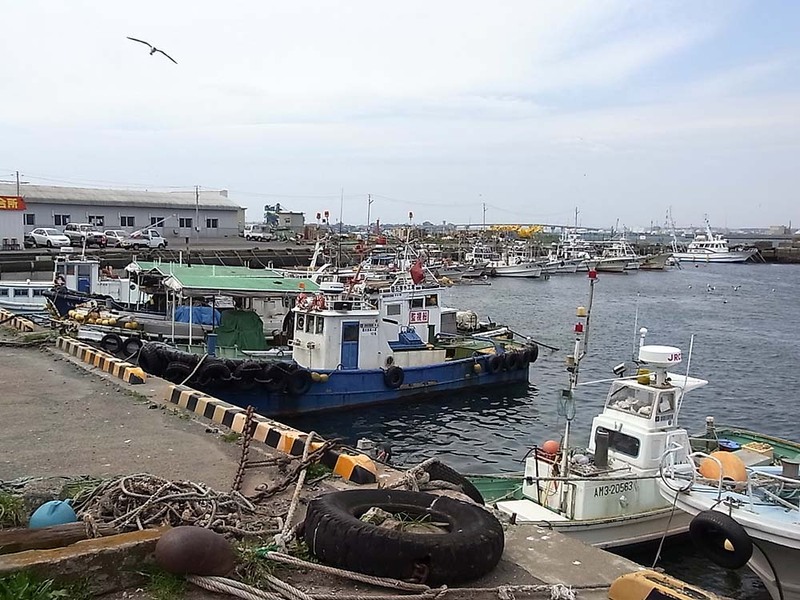 Also at the fishing port.